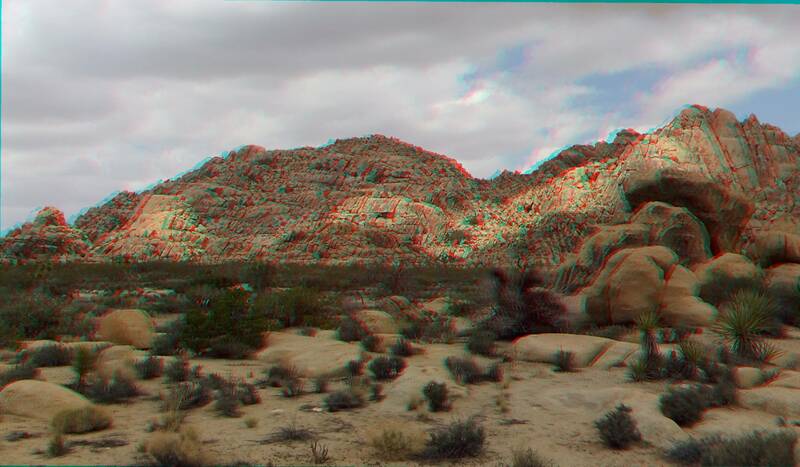 MY PEREGRINATIONS TOOK ME into the area opposite Outer Mongolia this day. 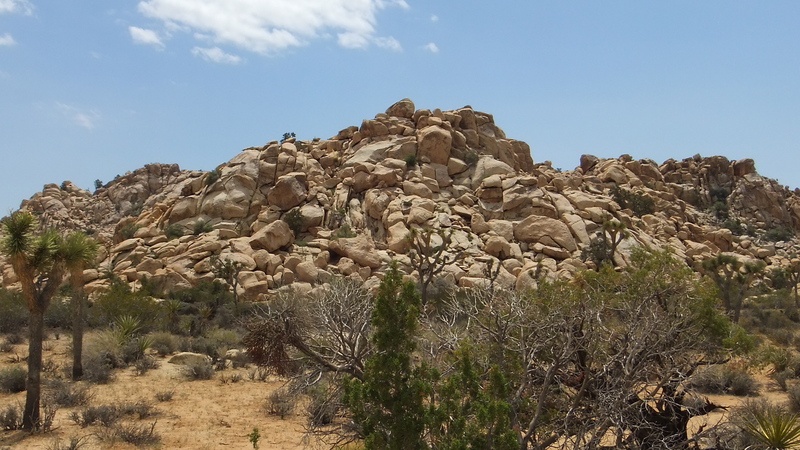 I lunched under some pinyon pines whose partner is Mistaken Rock. 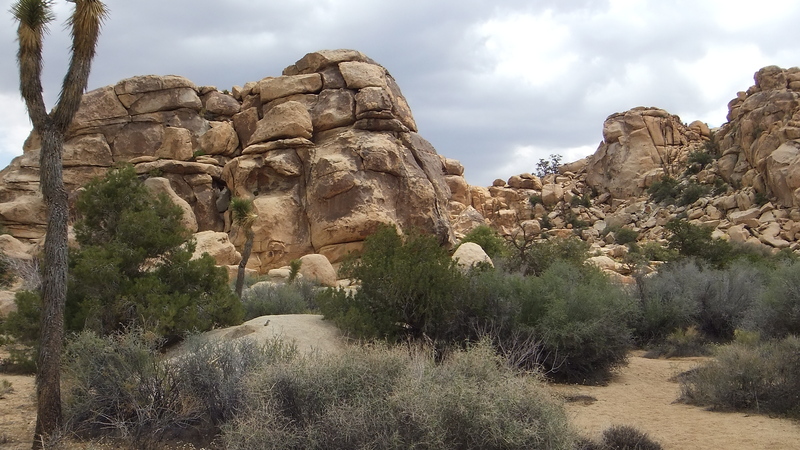 Although I didn’t realize it at the time, I later read about this small granite formation in Alan Bartlett’s The Wonderland Guide. 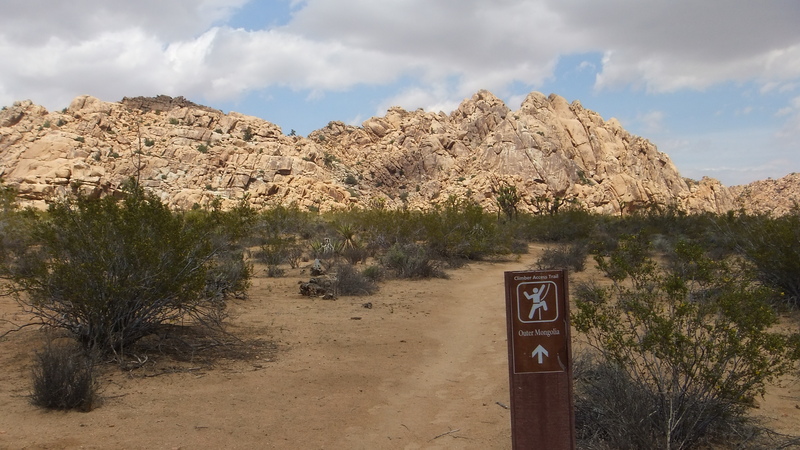 Full from lunch, I rose off the conveniently placed boulder, stretched arms & legs, and within minutes—having just passed a marker for the branch-trail to Outer Mongolia—I stumbled upon one of those once-in-a-blue-moon treasures that JTNP offers the intrepid back-country hiker. 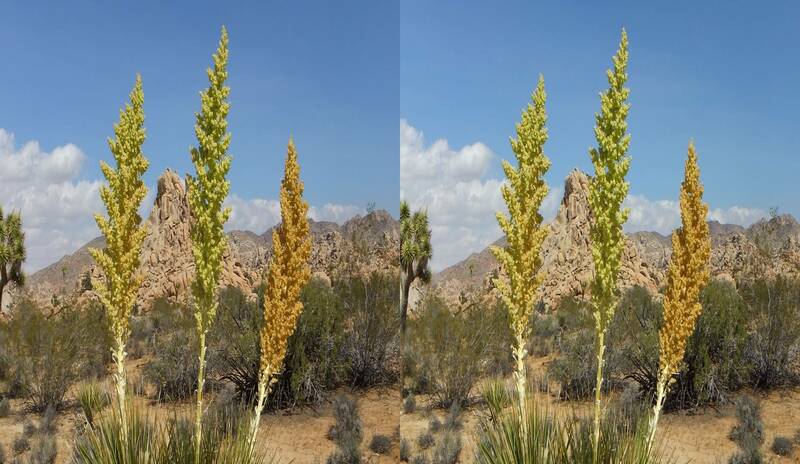 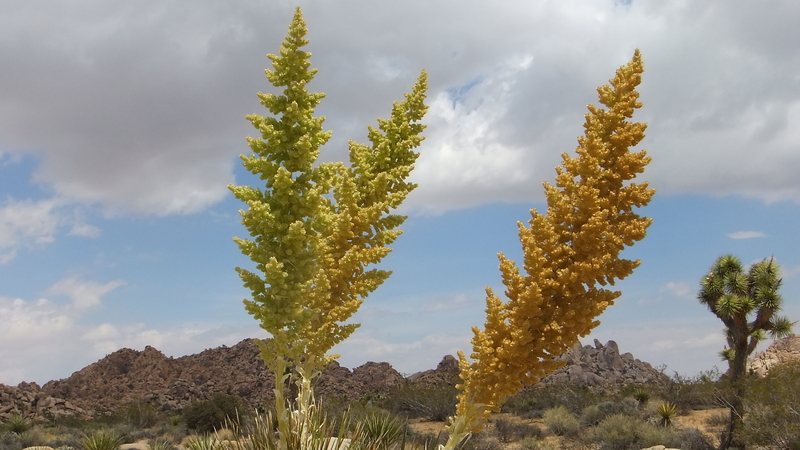 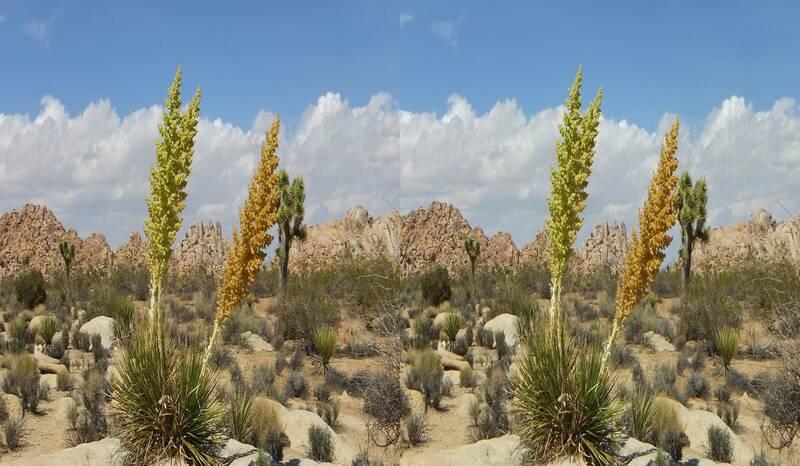 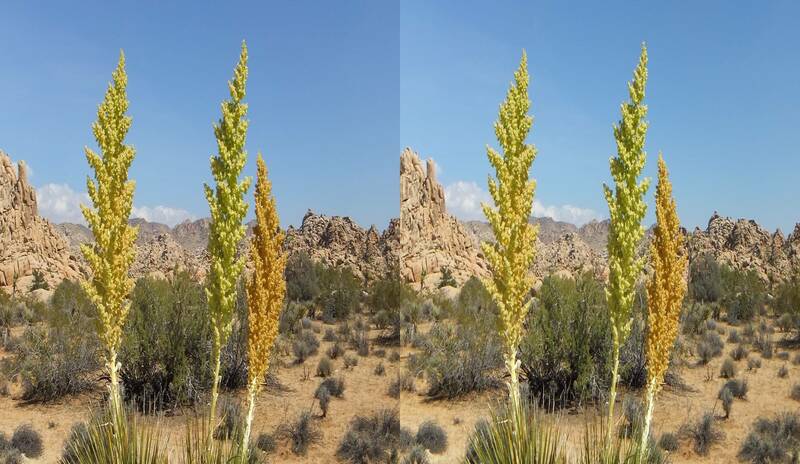 This was a triple nolina in full, robust and colorful bloom—eight to 10ft high—with yet a fourth specimen, possibly a different variety, a few strides right of the triplet. 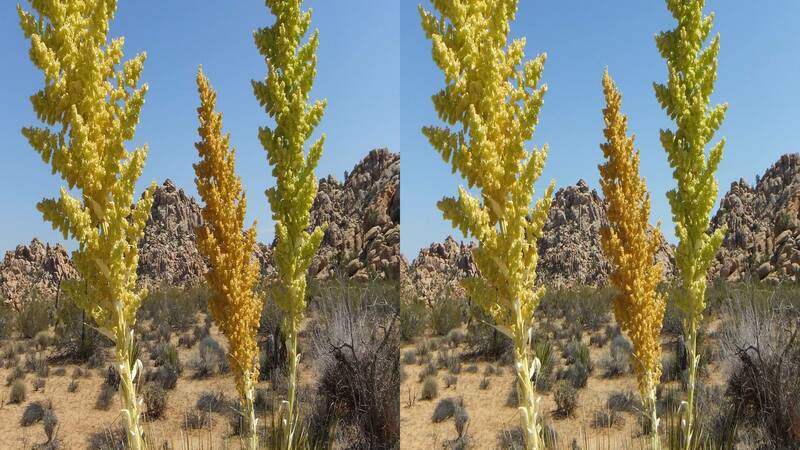 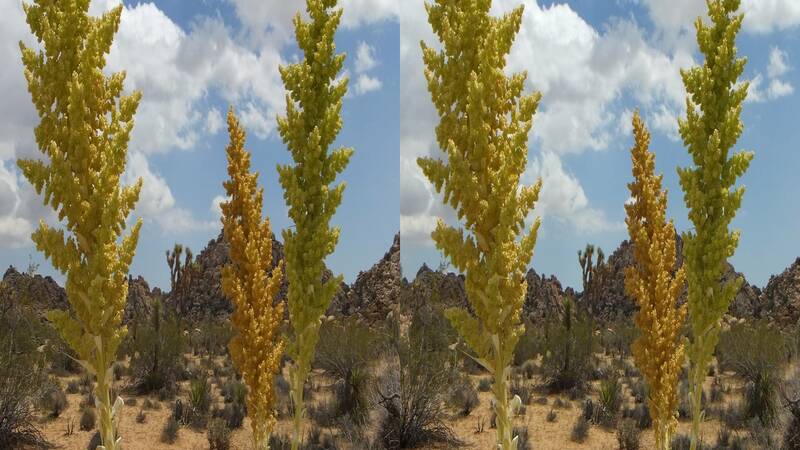 If you are wondering about the colors, cream-yellow, pale green, and rich golden in hue, the three plants involved must have blossomed sequentially. 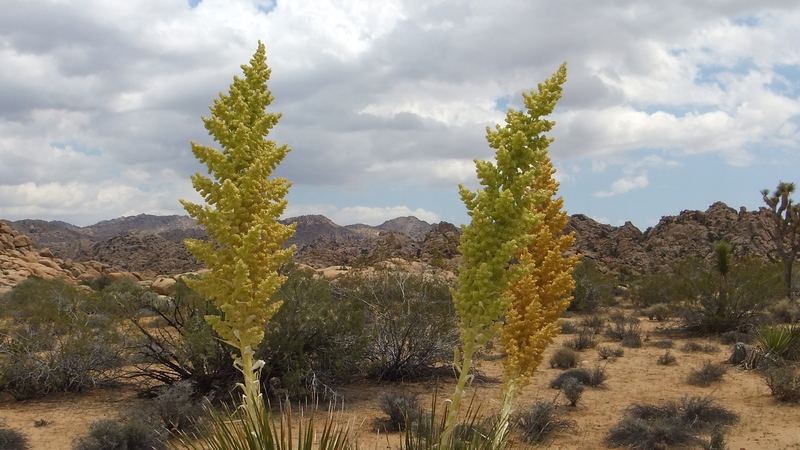 The greenish one being the most recent. 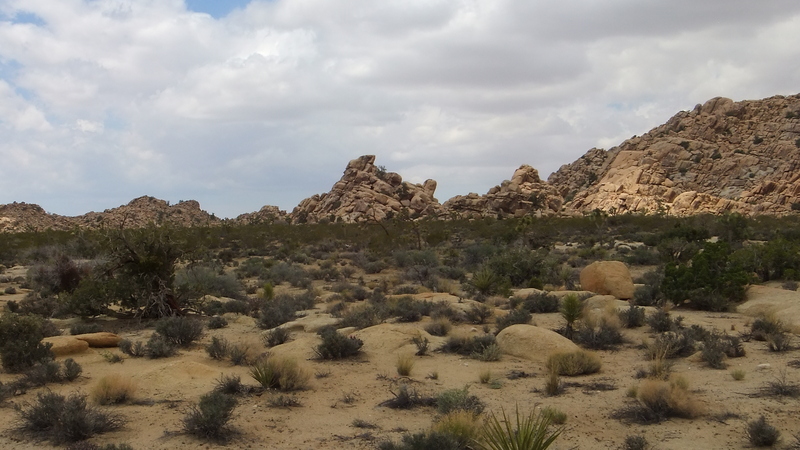 The time was about one o’clock in the afternoon. 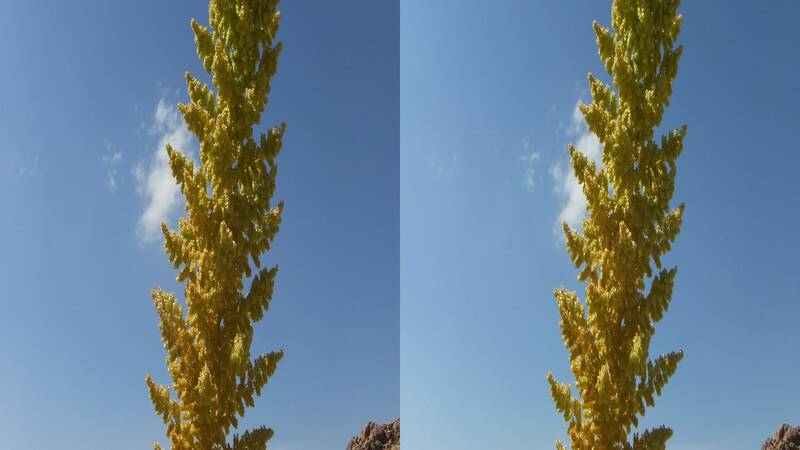 To the west, the sky was cloud-free and blue. 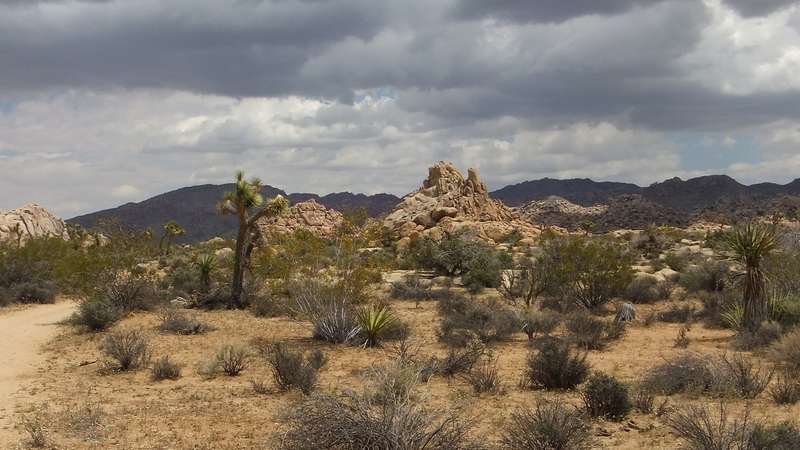 Overhead and well eastward looking into the North Wonderland from where I stood, conditions were mainly cloudy but with regular big patches of sunlight breaking through. 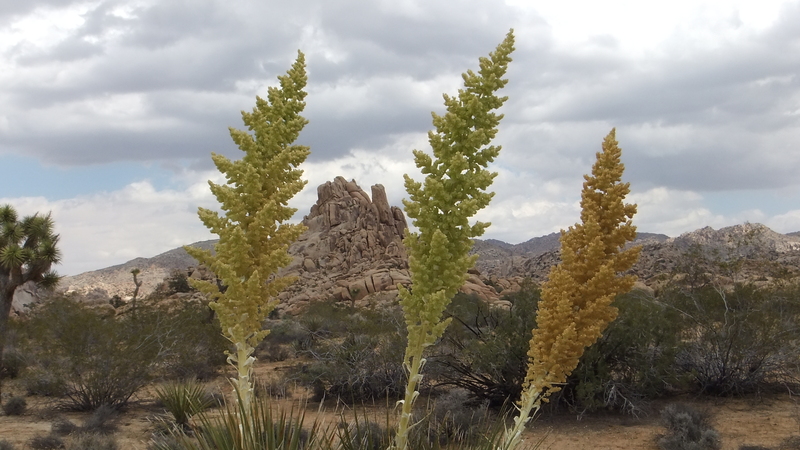 A stiff Spring breeze was blowing. 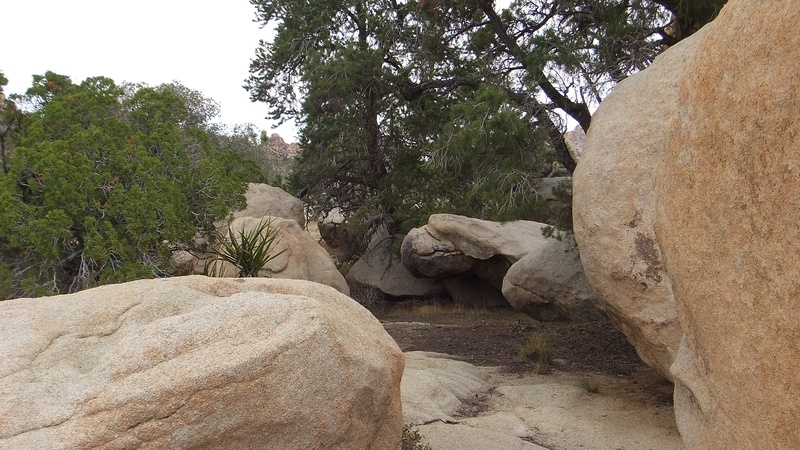 This gave me numerous opportunities to catch the light playing on the nolinas and rocks, but I had to act swiftly. 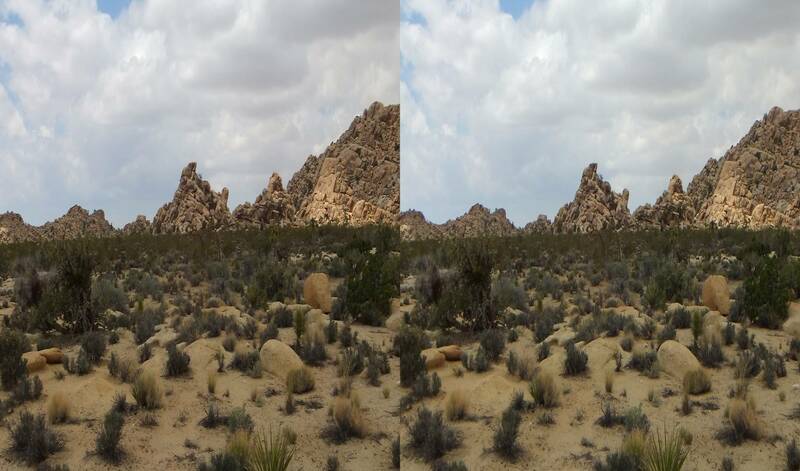 The moving clouds would, within 30 to 60 seconds, obscure the sun again. 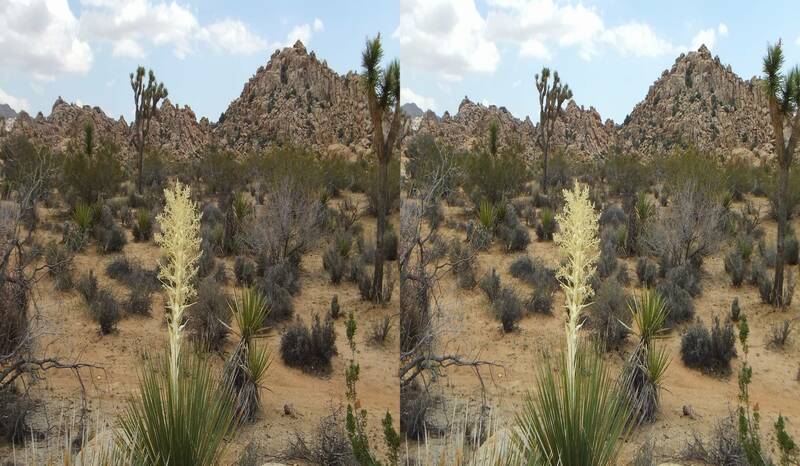 Upon first sighting the nolinas in bloom—they were about 150 yards south of the main trail—the area was shaded, as you will see from the first few images. 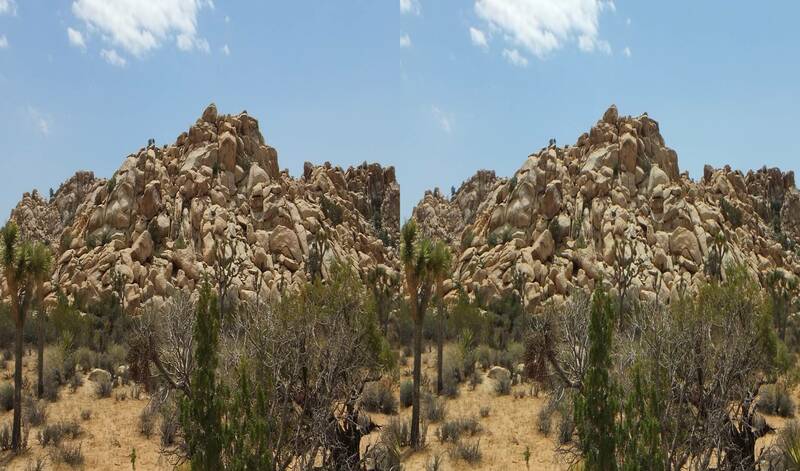 However, once in position, when I looked over my shoulder behind me, the patches of sunlight were visibly advancing into the opening of the large valley dominated by “Outer Mongolia.” (“Outer Mongolia” hill lies on the northern extremity.) 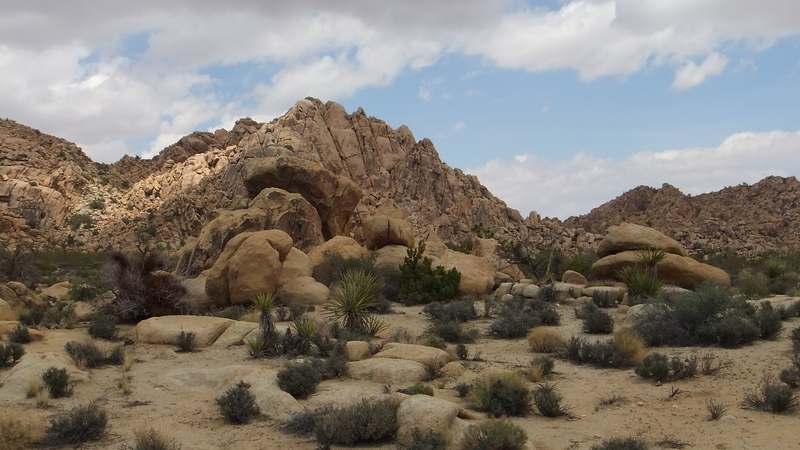 Every photograph you see on this page is original and untouched. 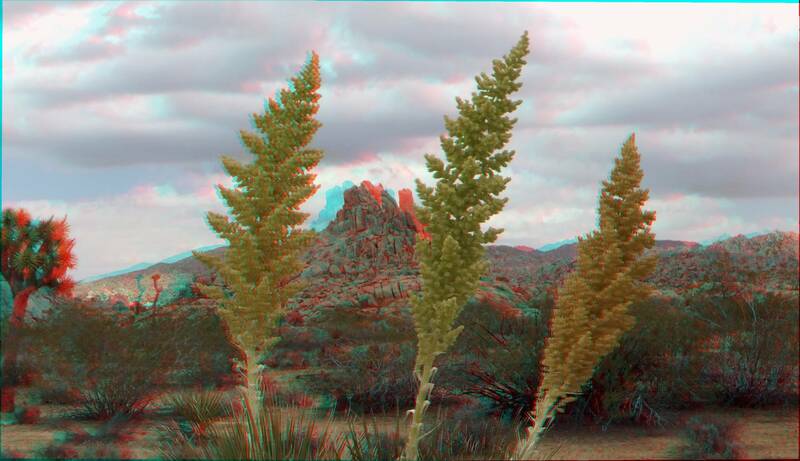 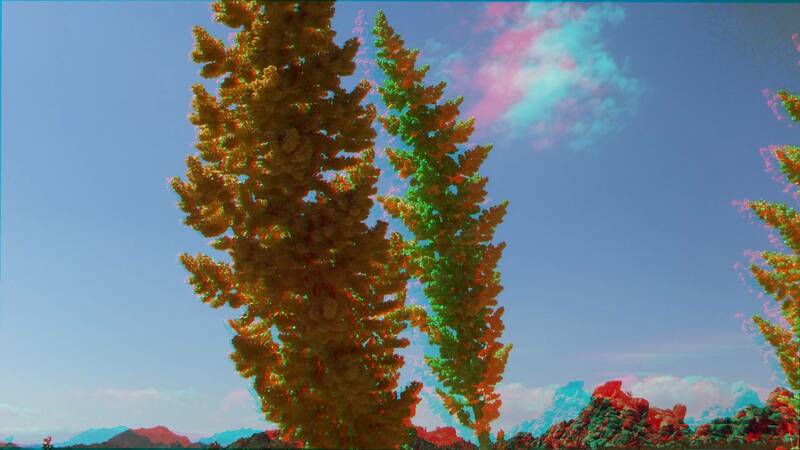 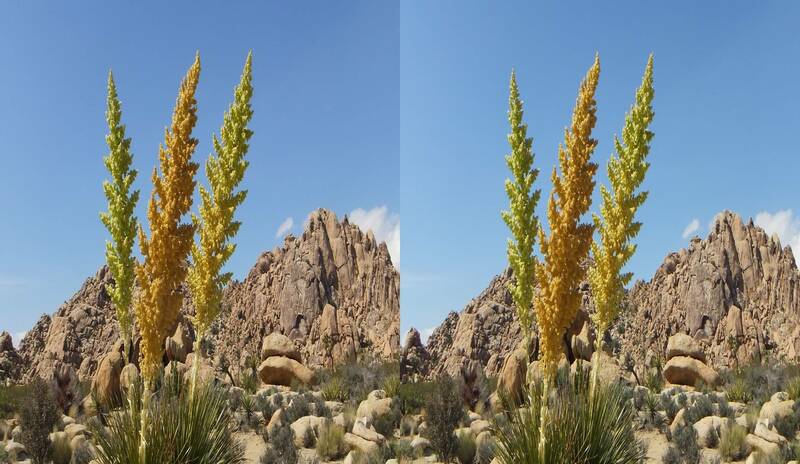 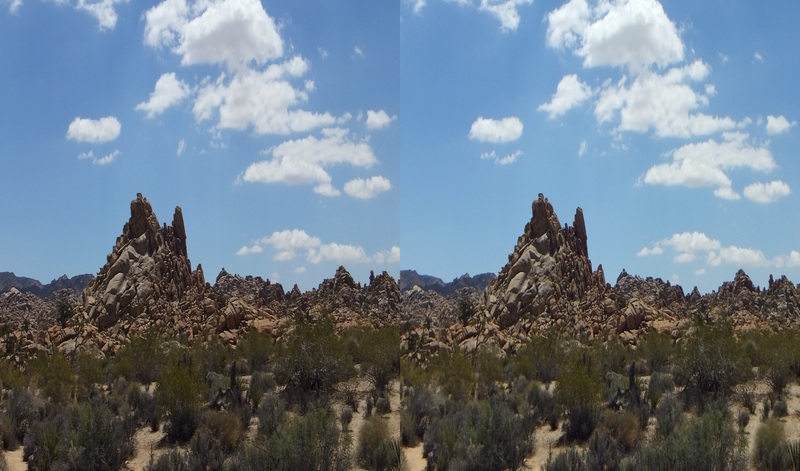 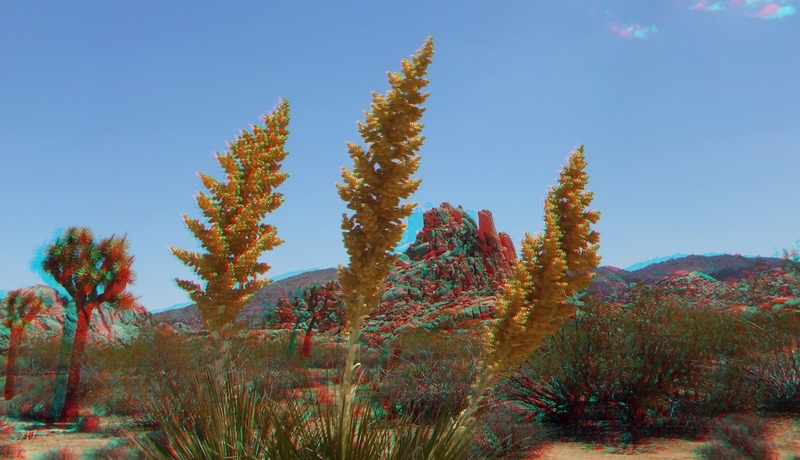 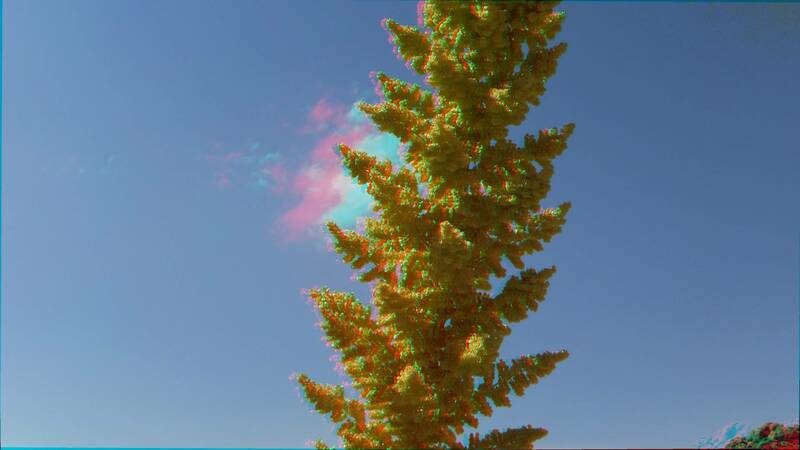 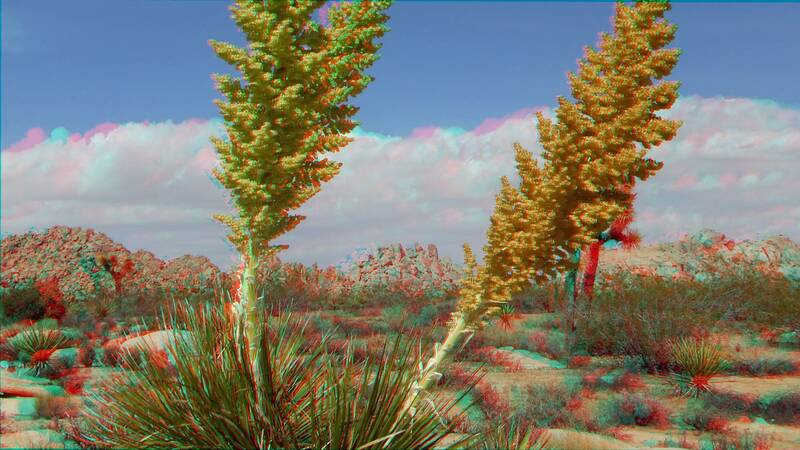 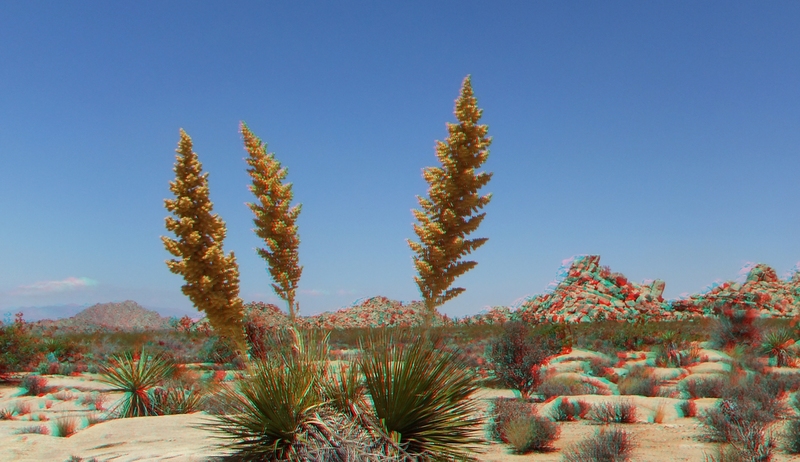 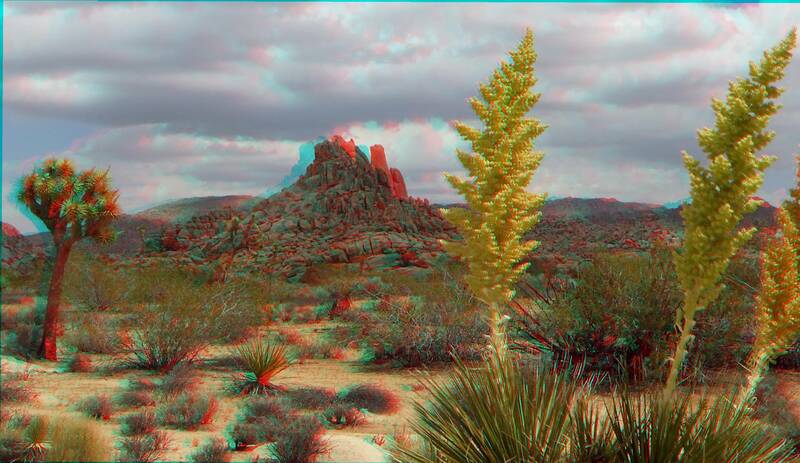 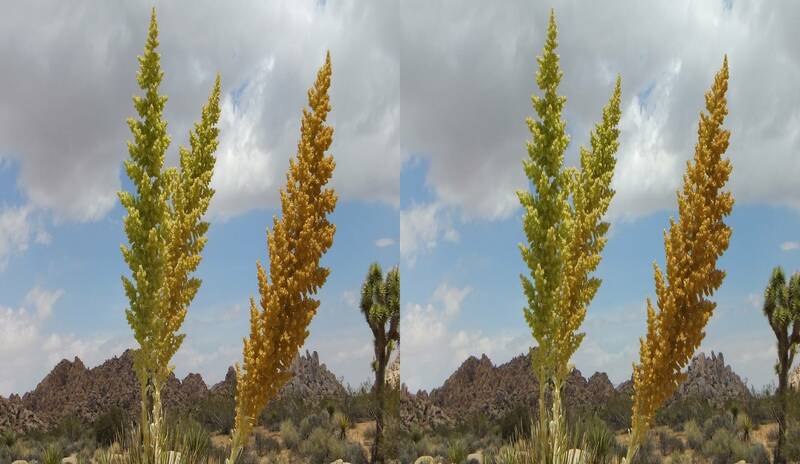 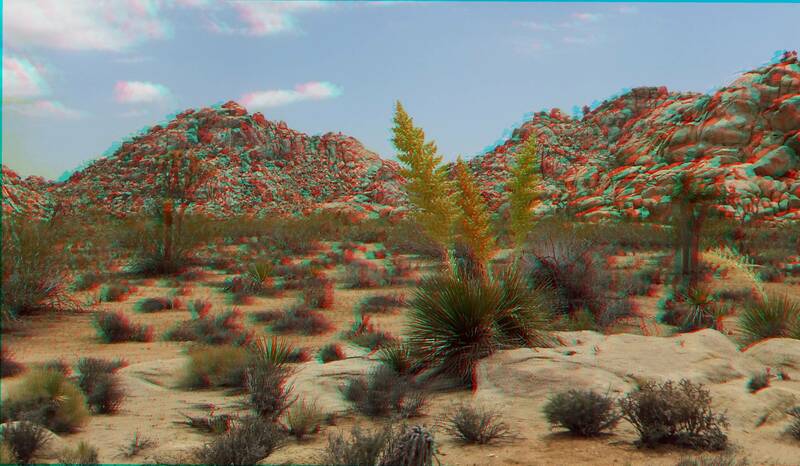 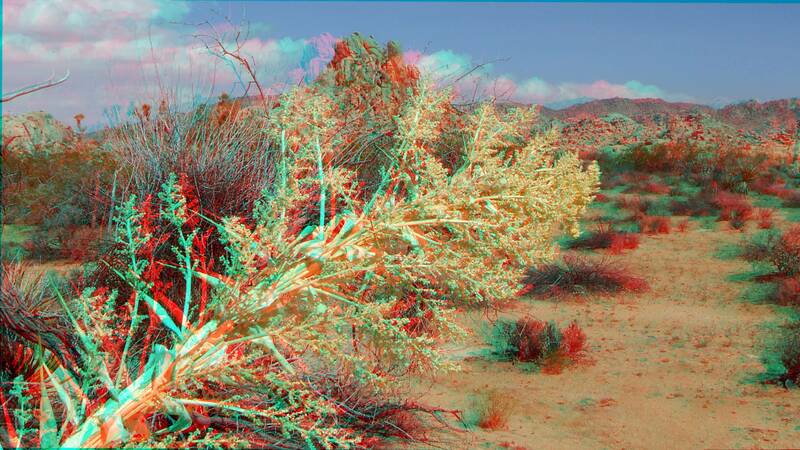 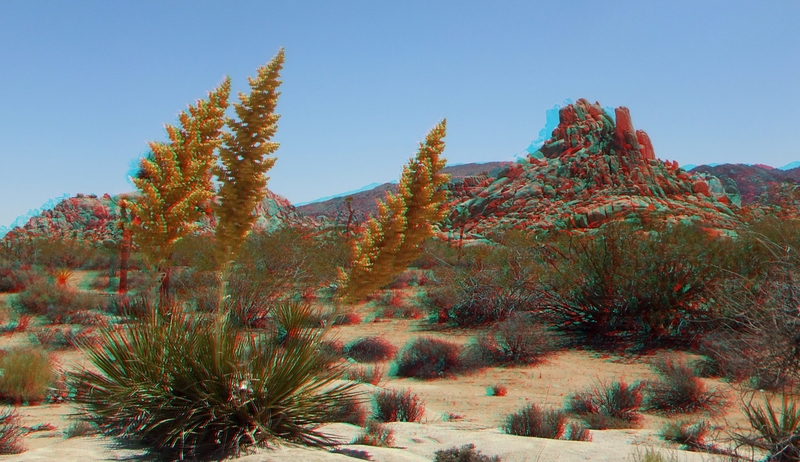 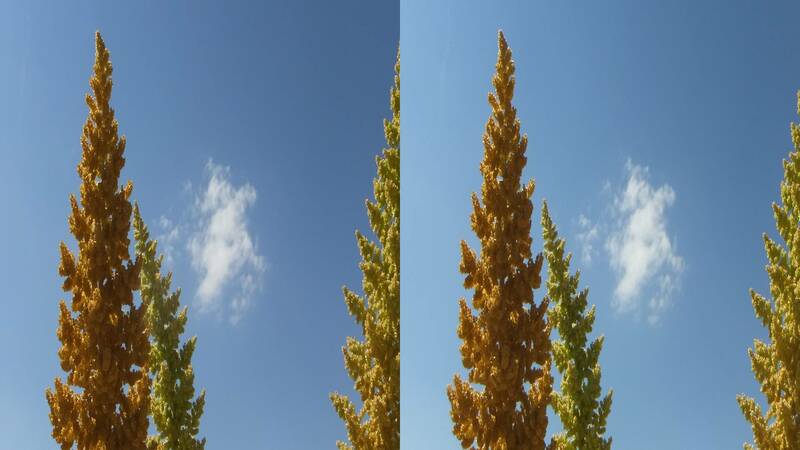 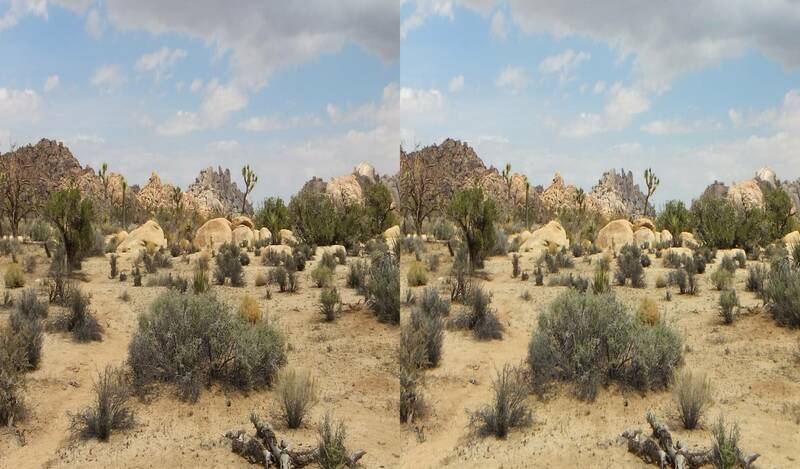 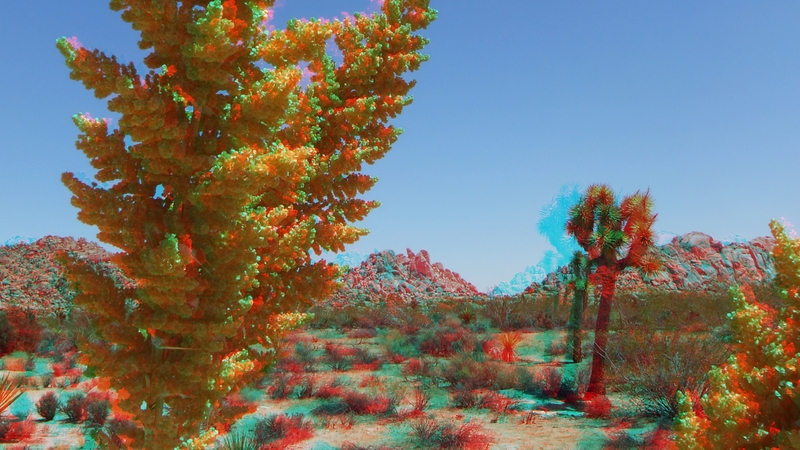 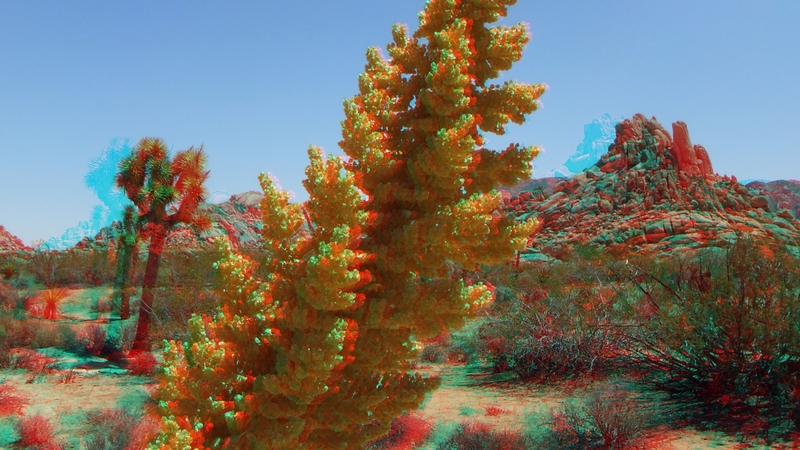 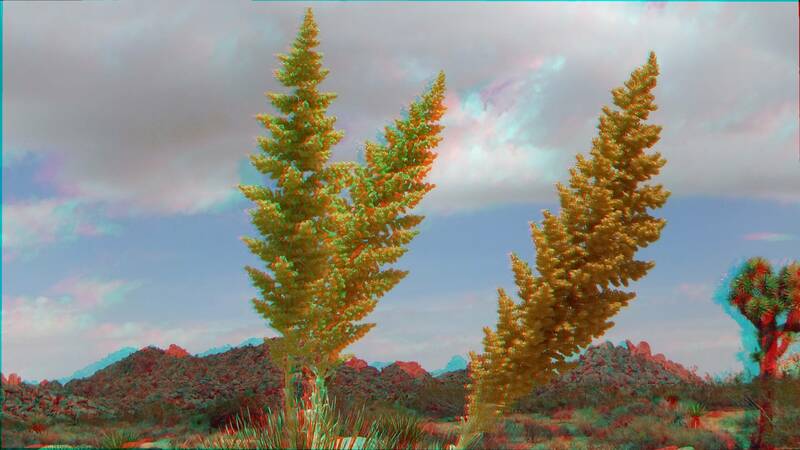 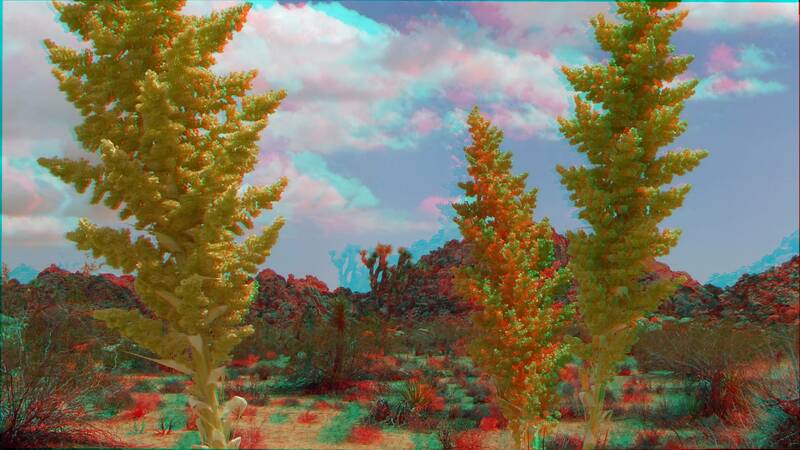 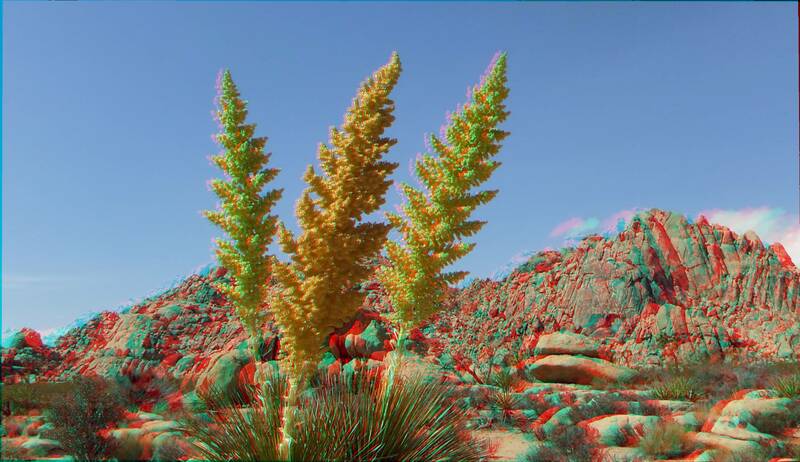 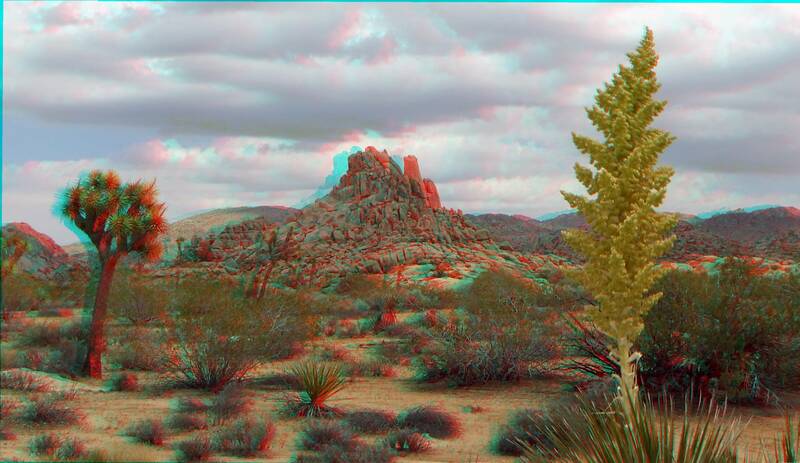 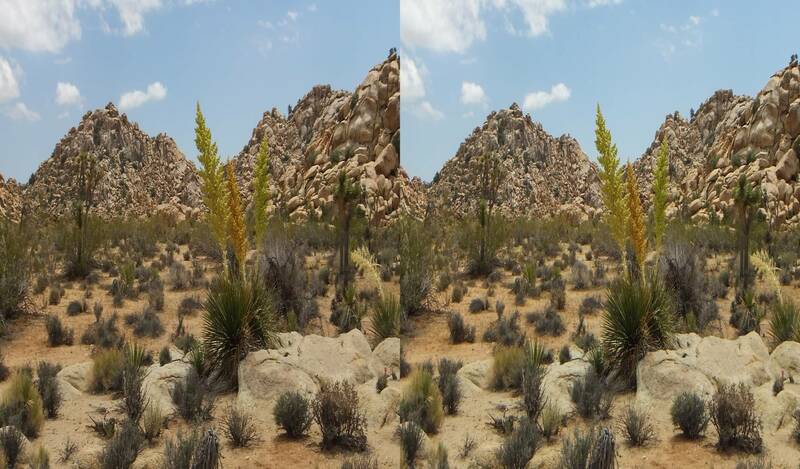 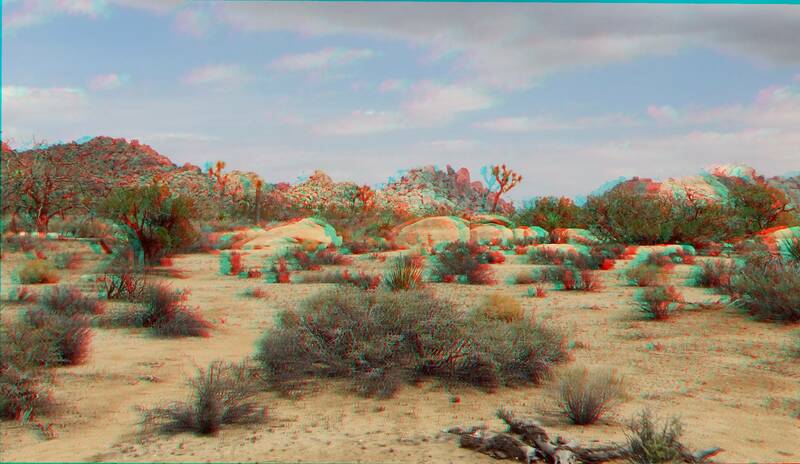 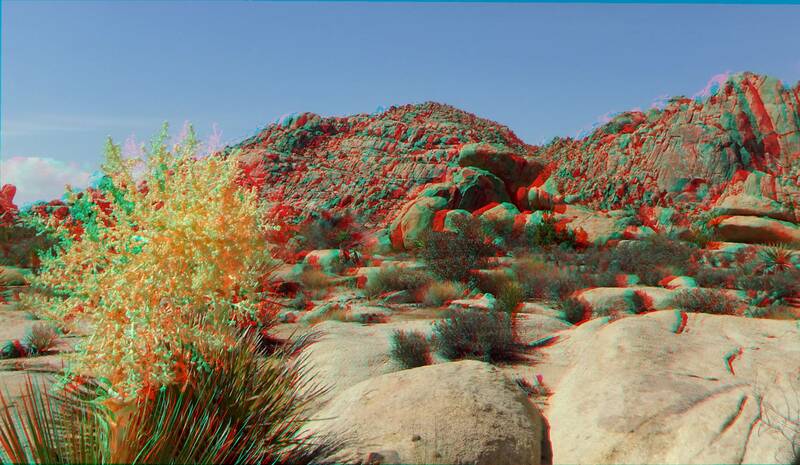 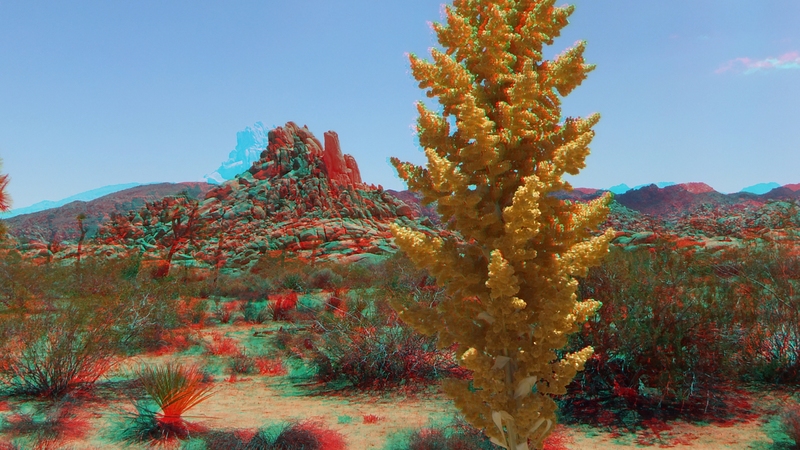 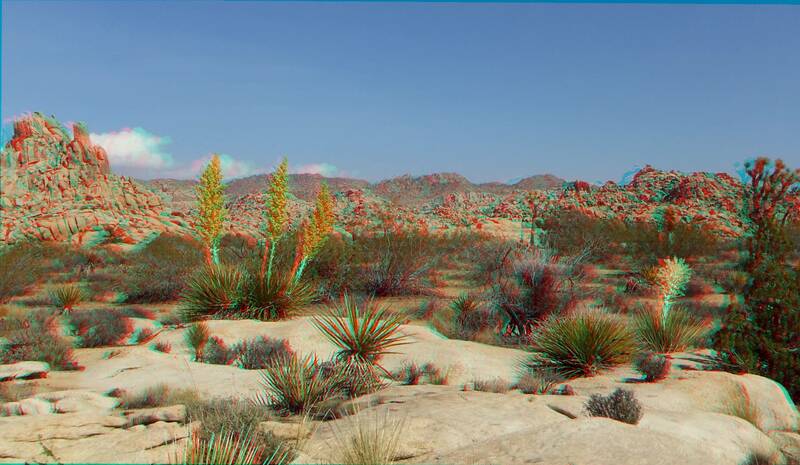 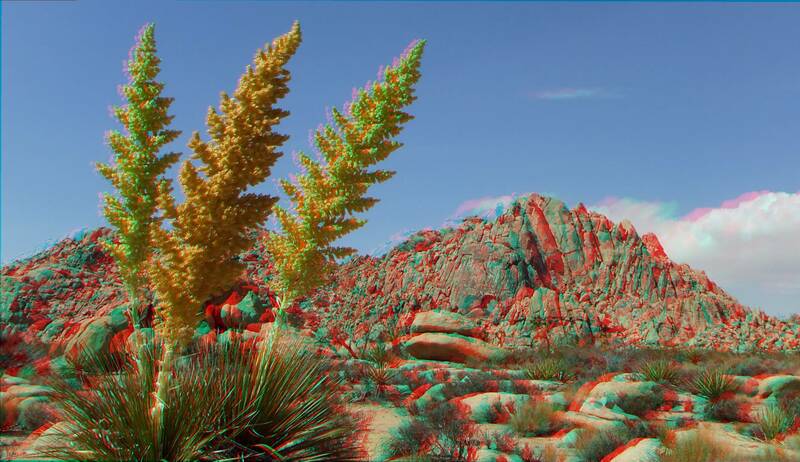 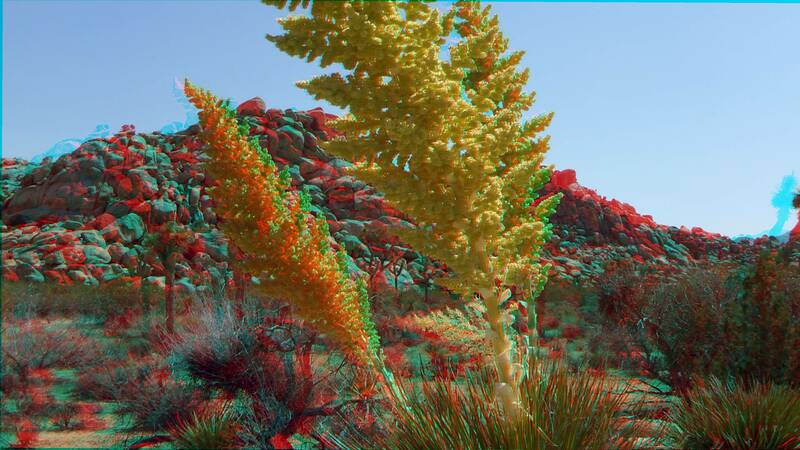 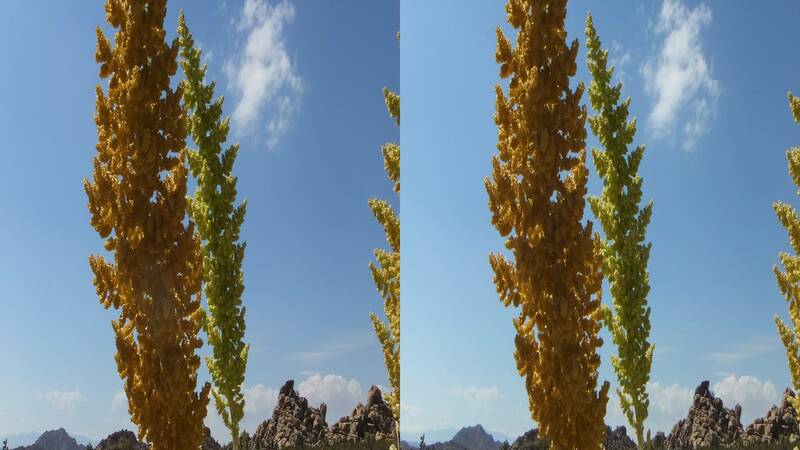 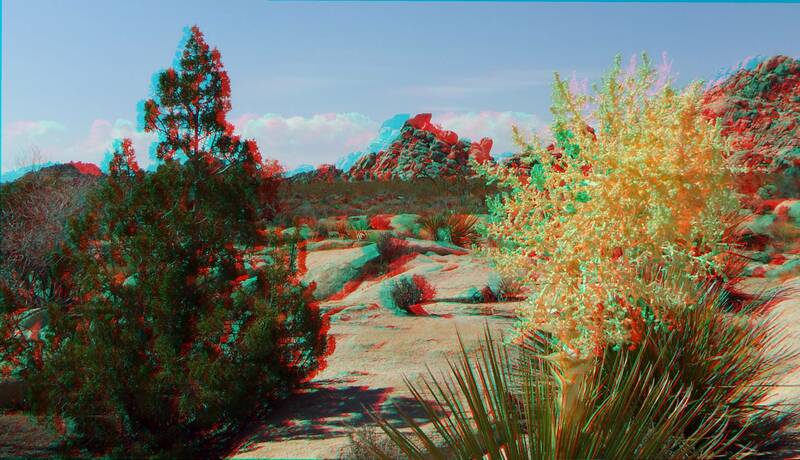 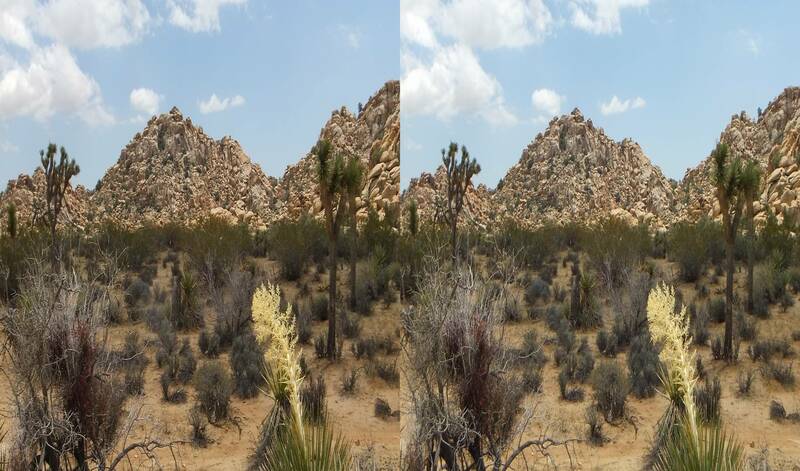 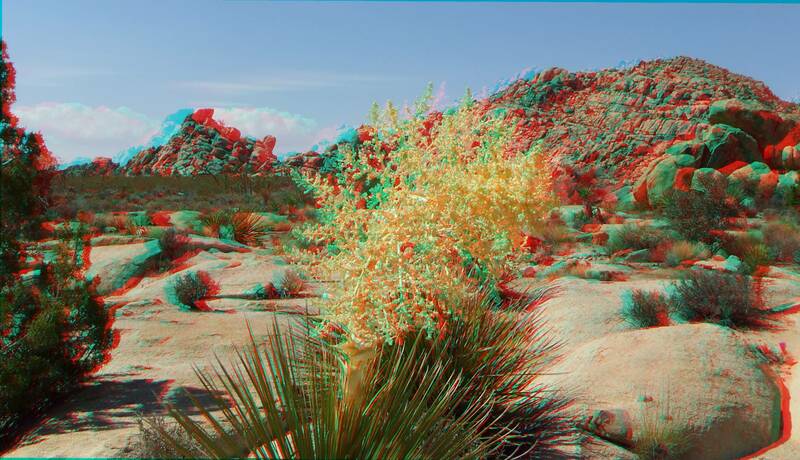 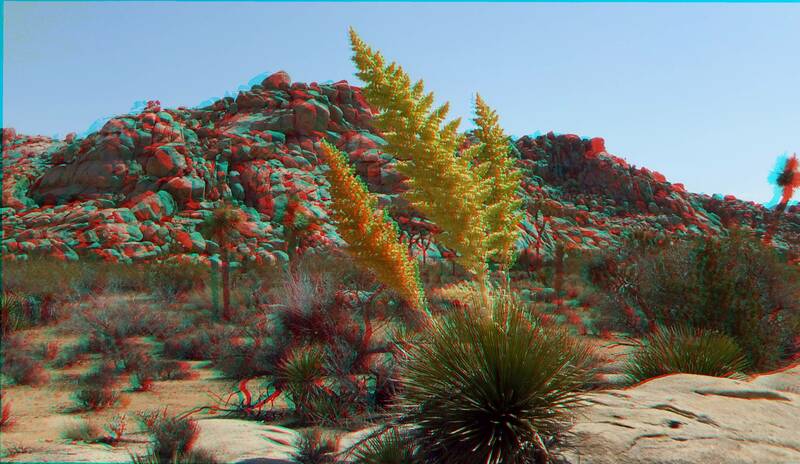 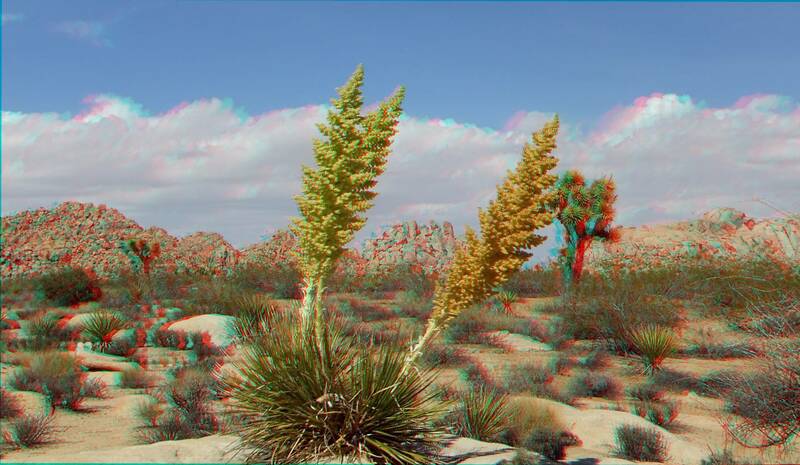 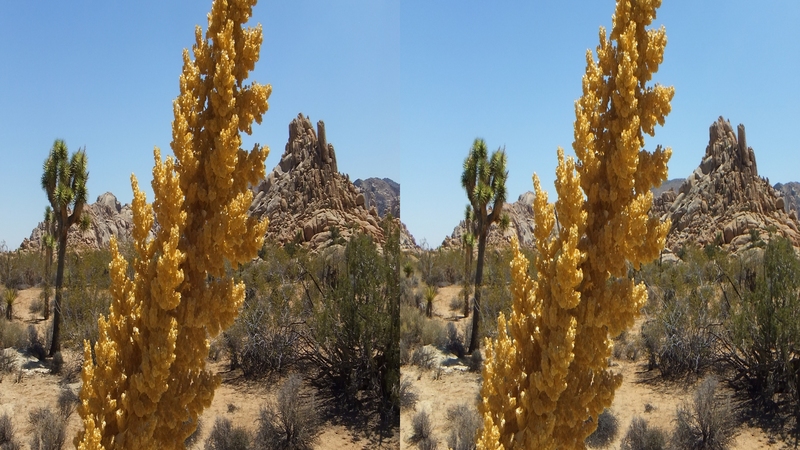 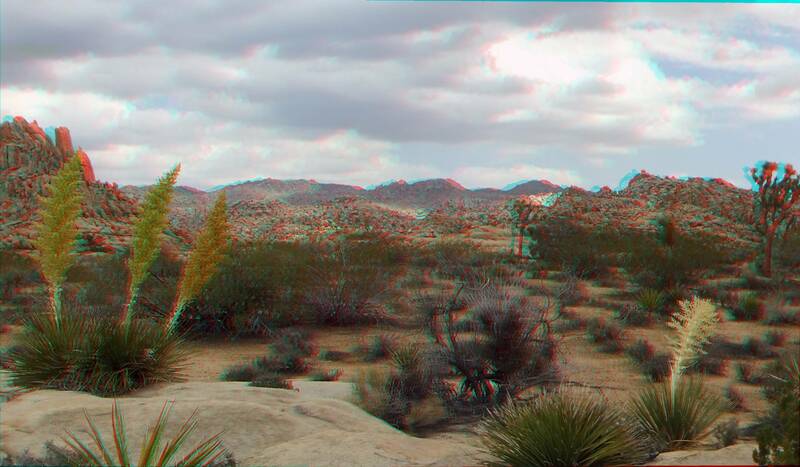 Below, enjoy the 1080p 3D Anaglyph Gallery, followed by downloadable 3D Half Side-by-Sides (for viewing on a 3D-enabled television); lastly, a 2D set of 1 p.m. (cloudy) and 3:30 p.m. (sunny) pictures in standard 3584×2016 pixels. 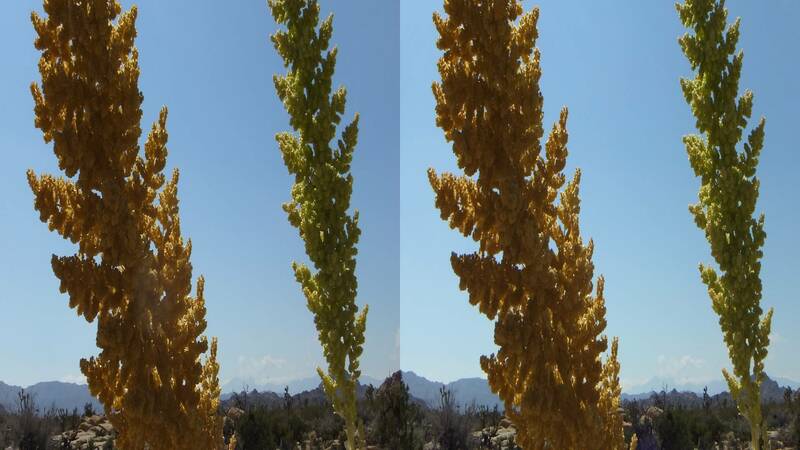 What a difference 2½ hours makes! 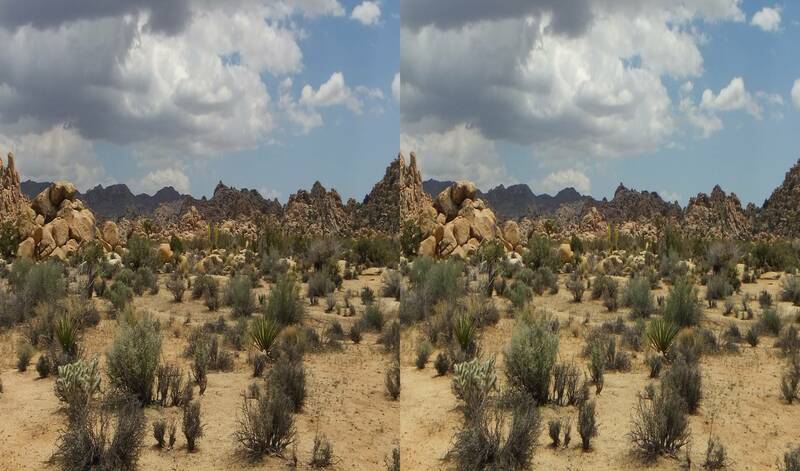 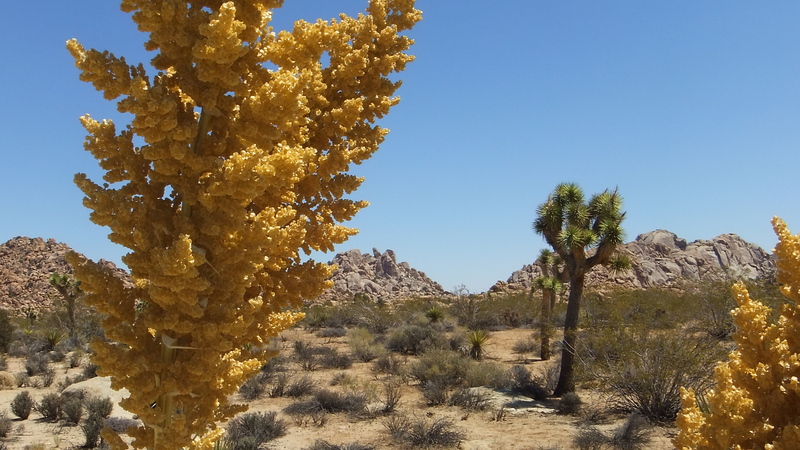 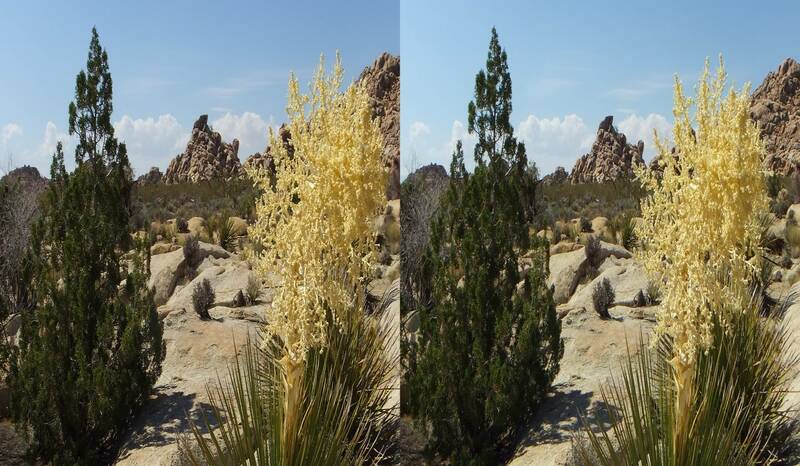 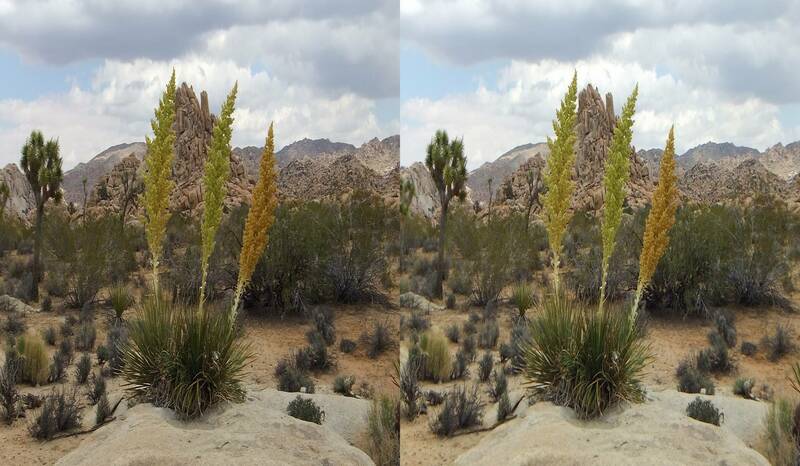 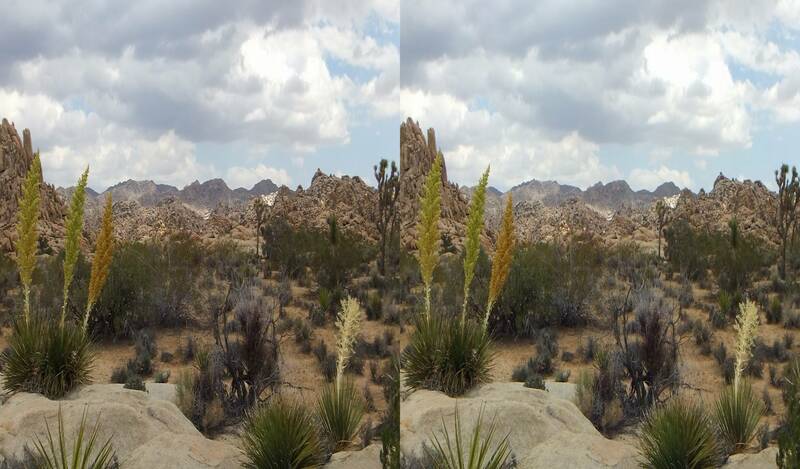 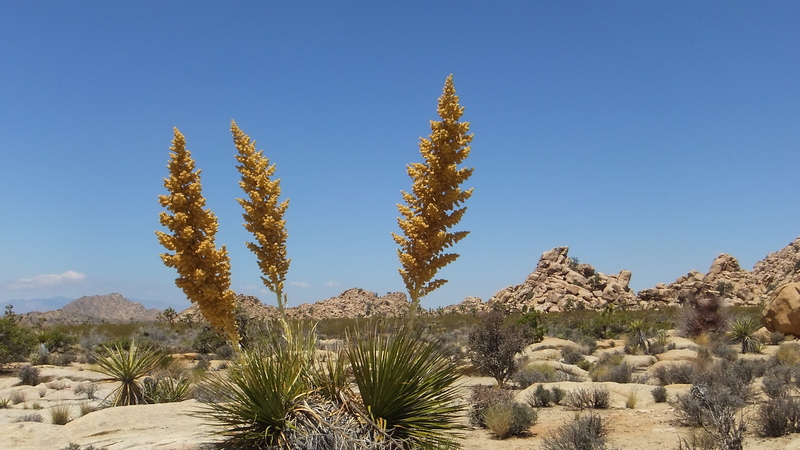 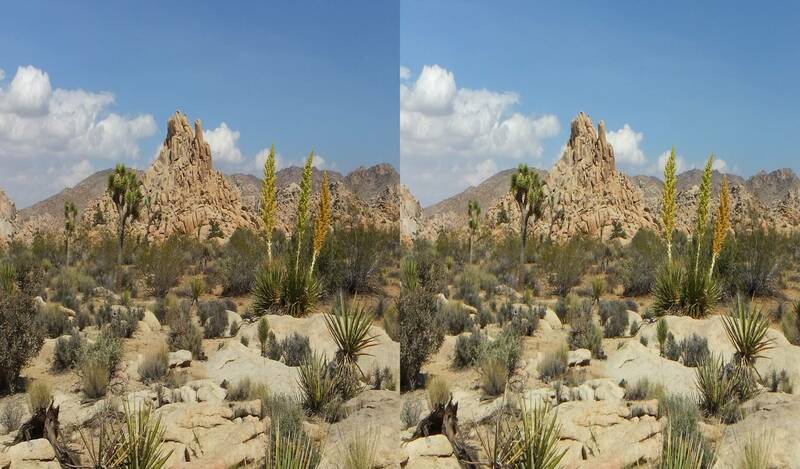 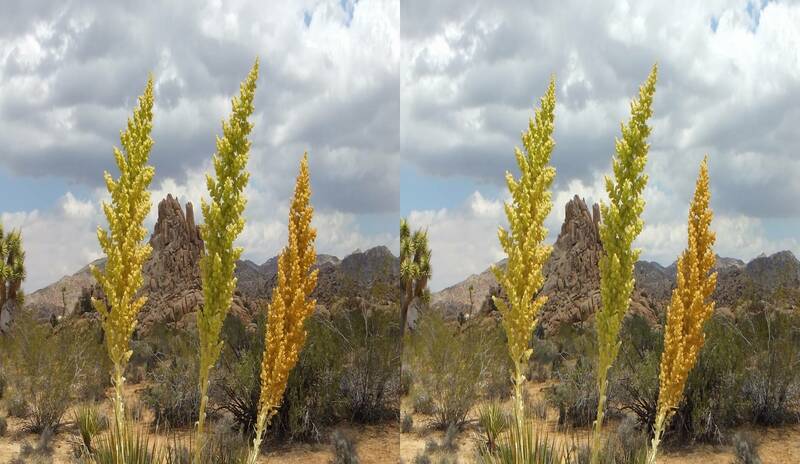 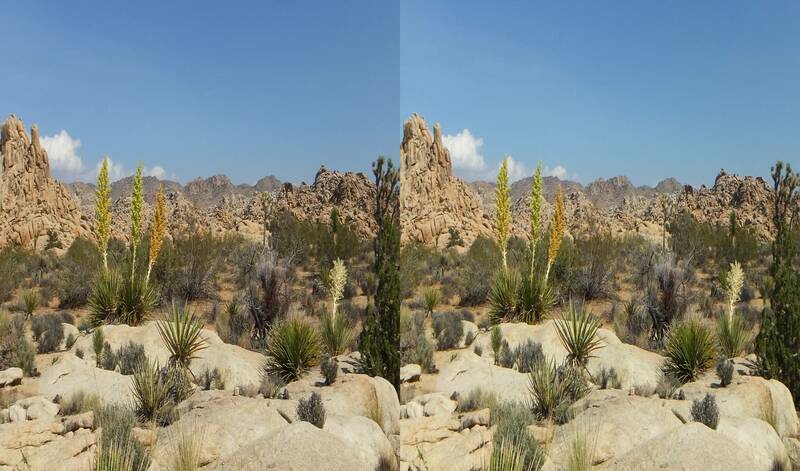 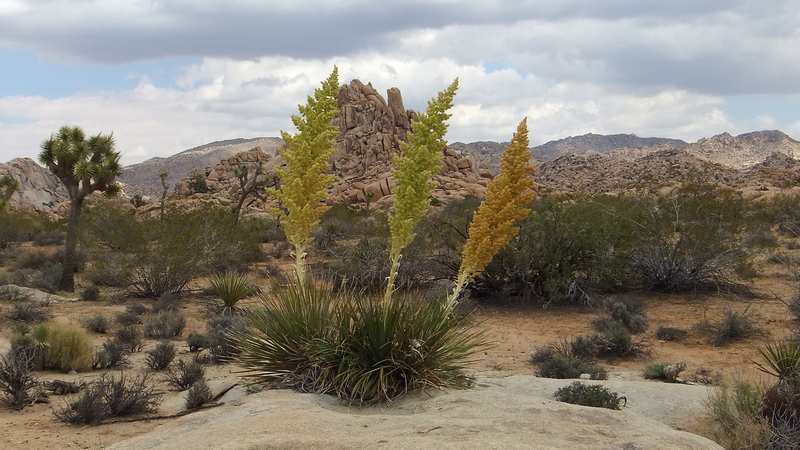 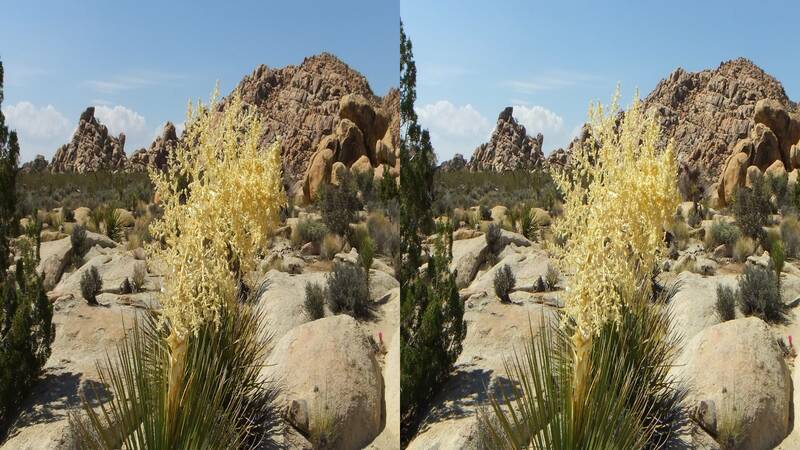 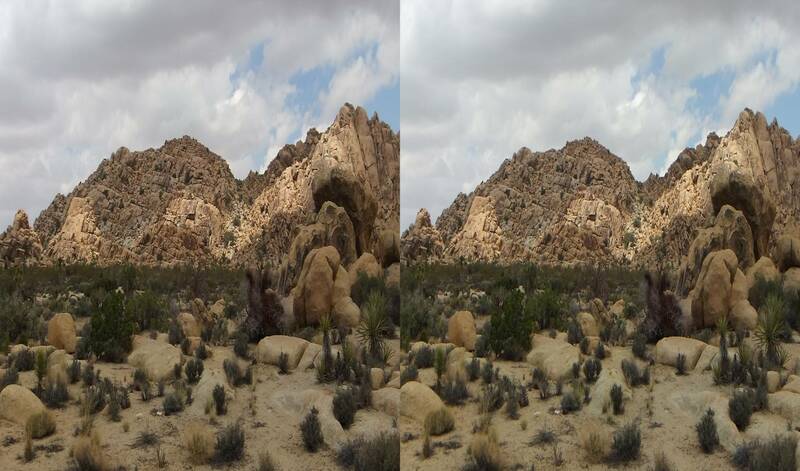 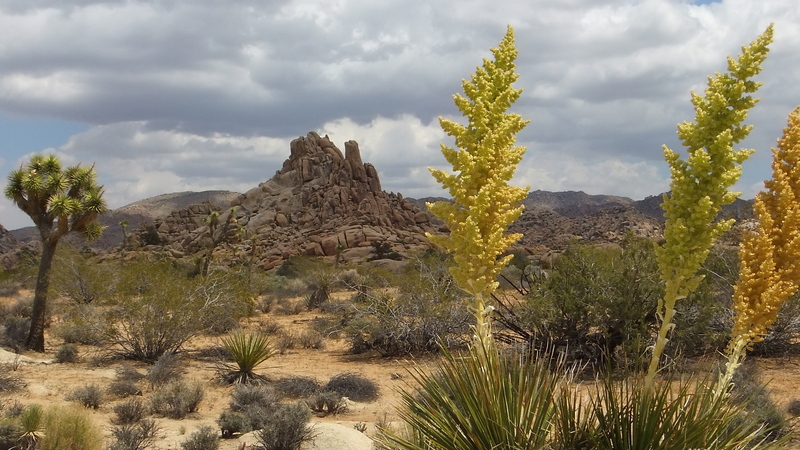 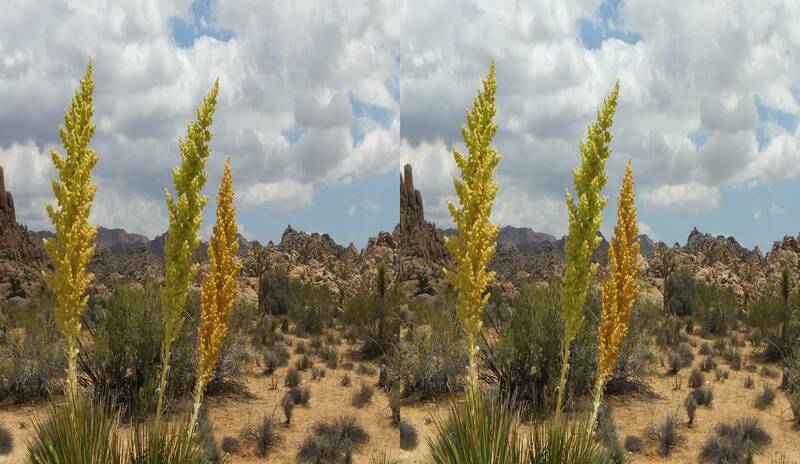 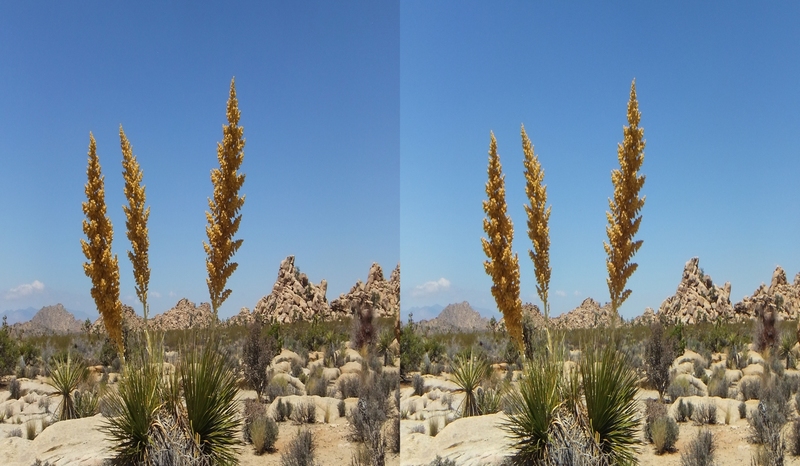 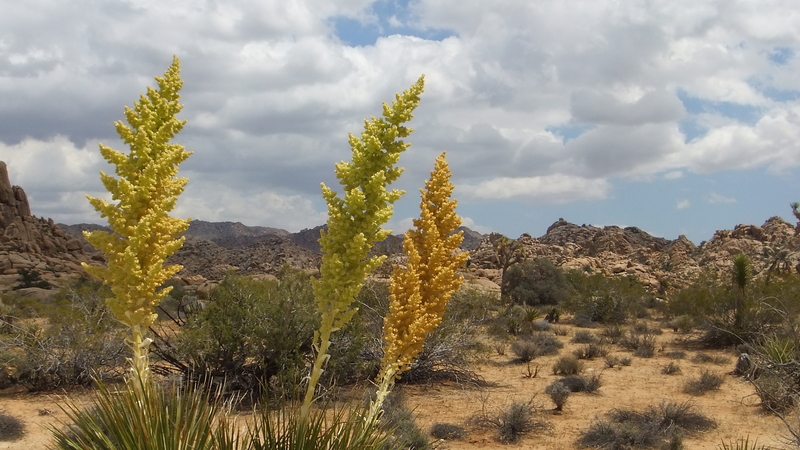 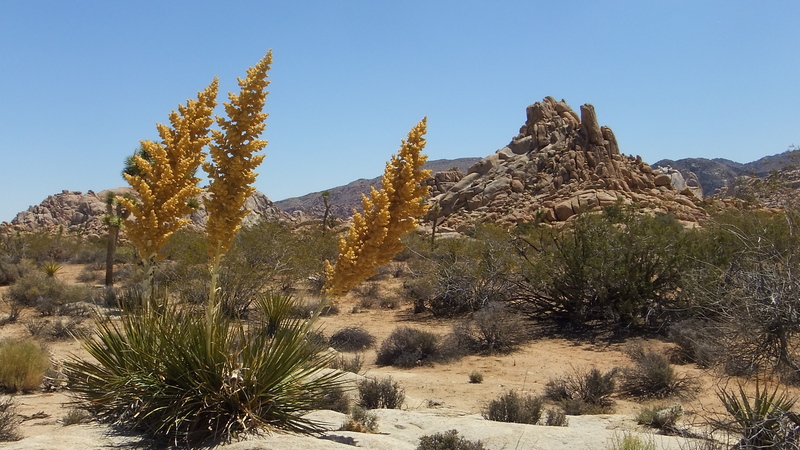 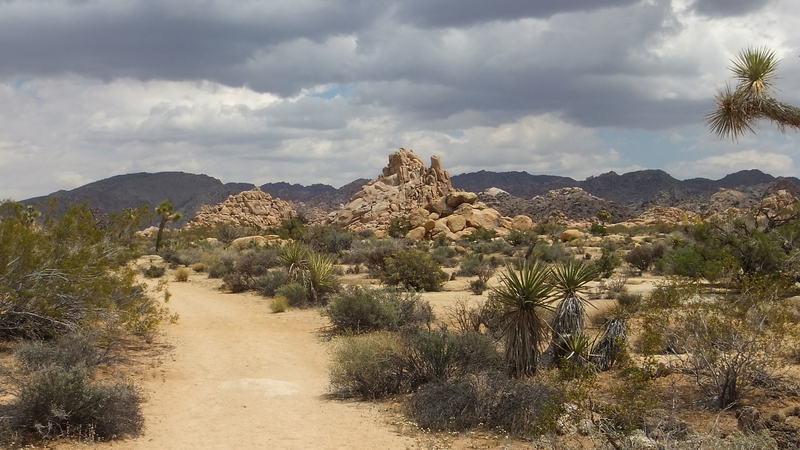 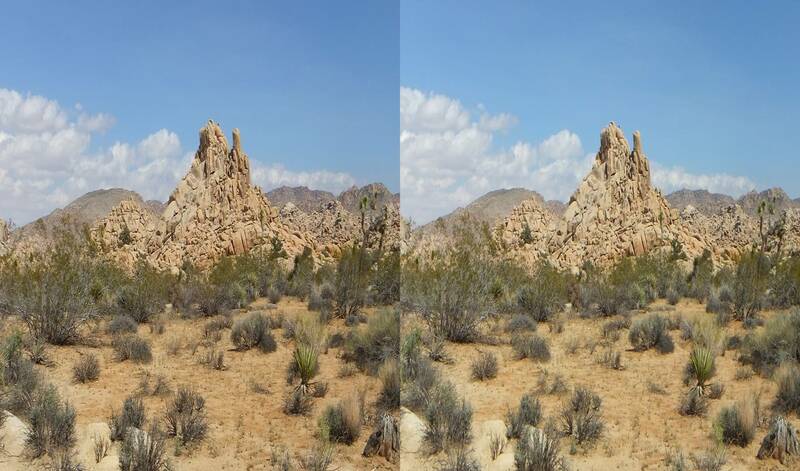 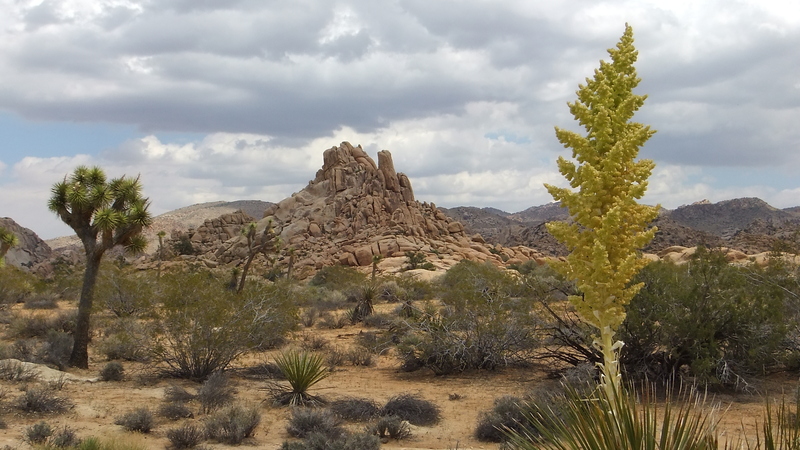 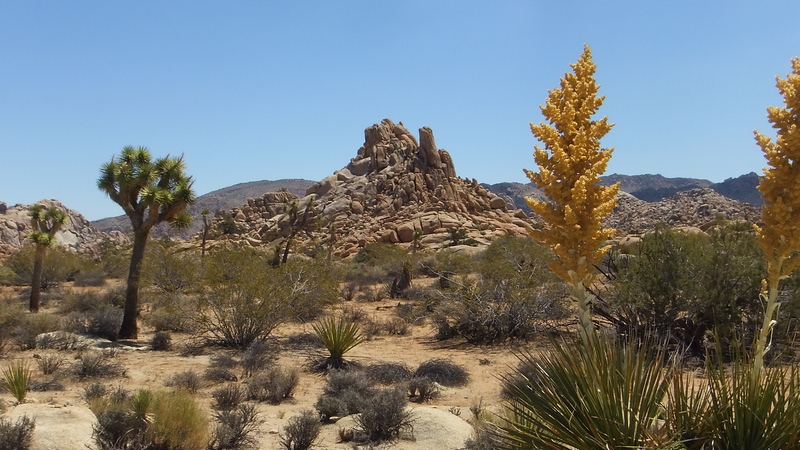 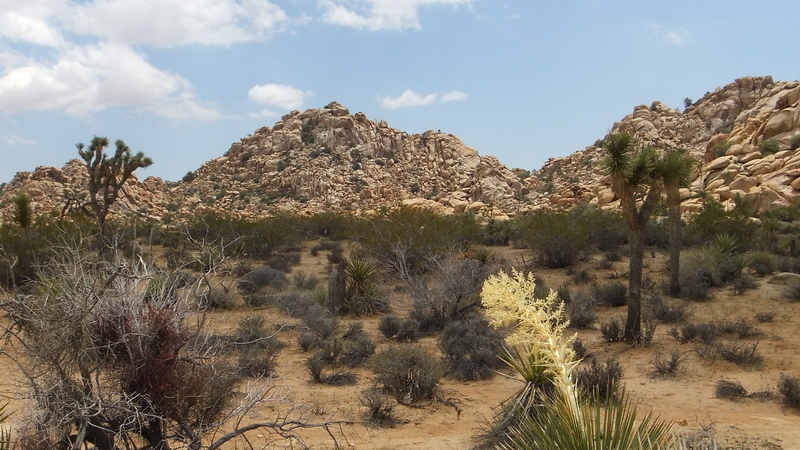 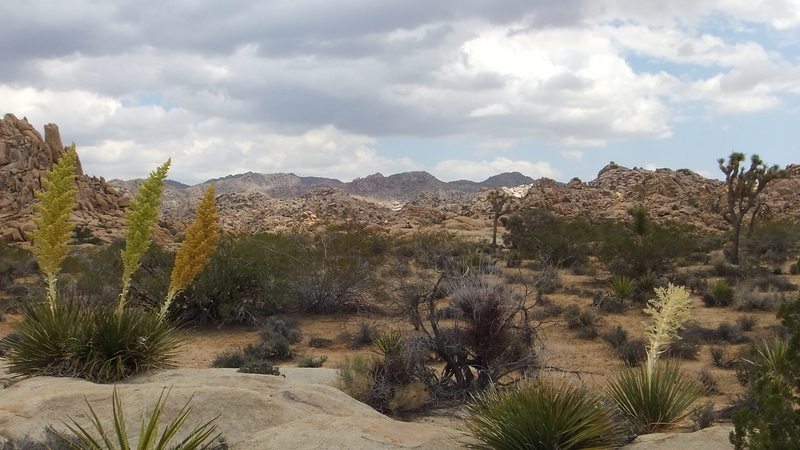 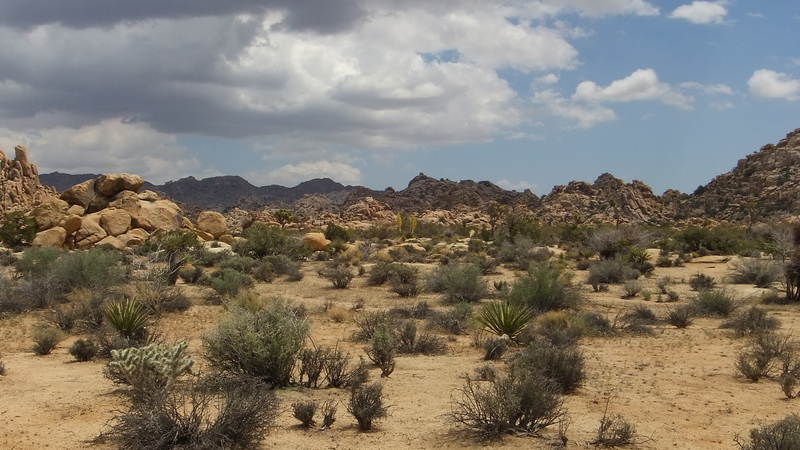 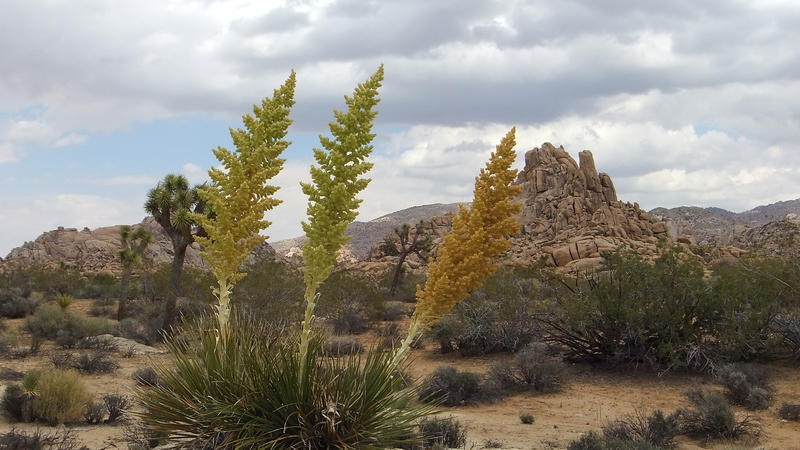 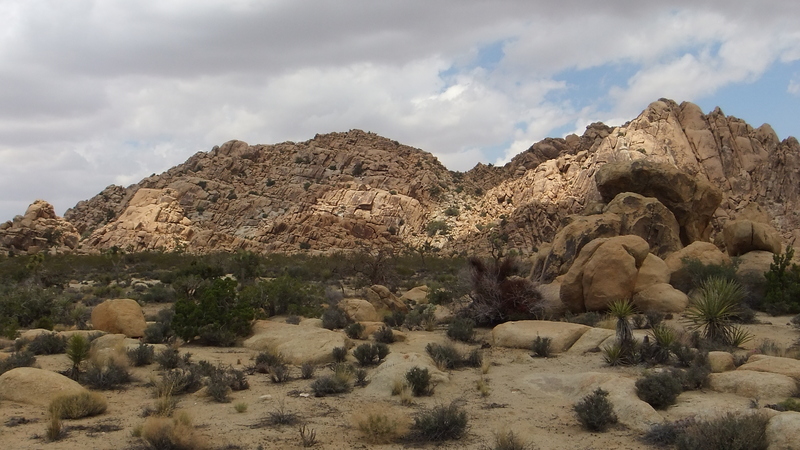 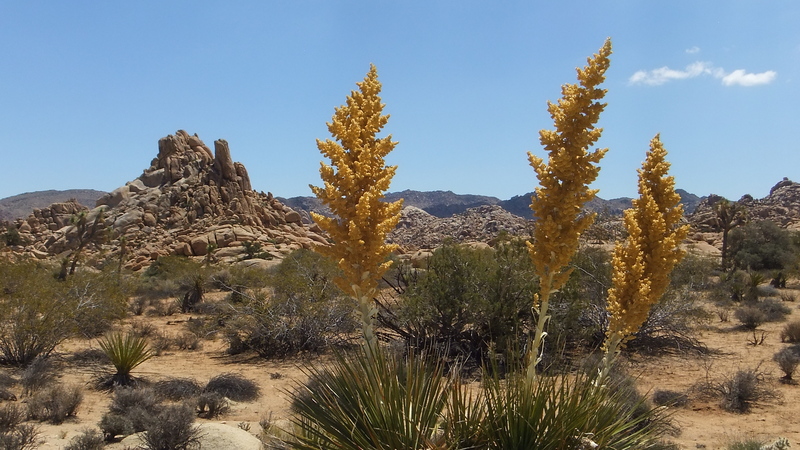 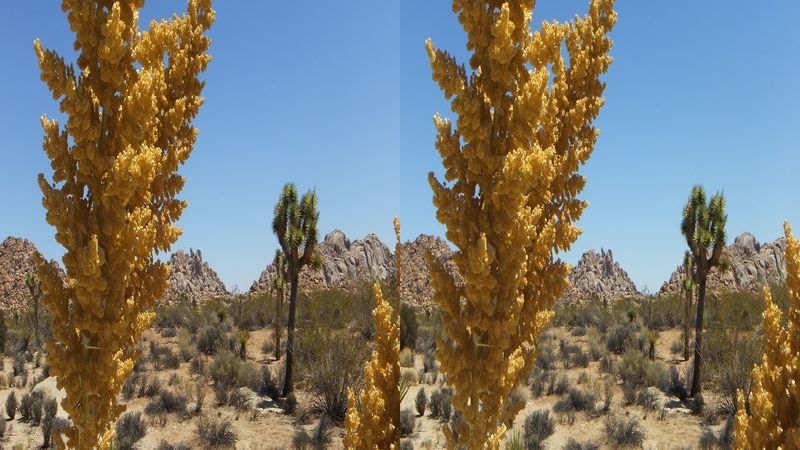 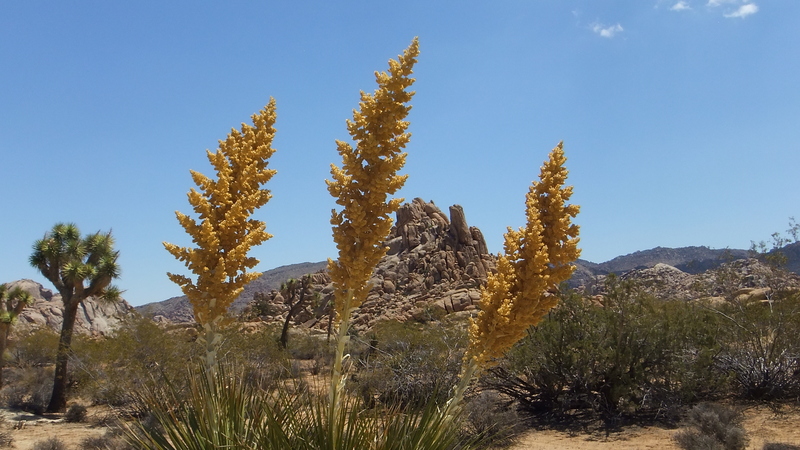 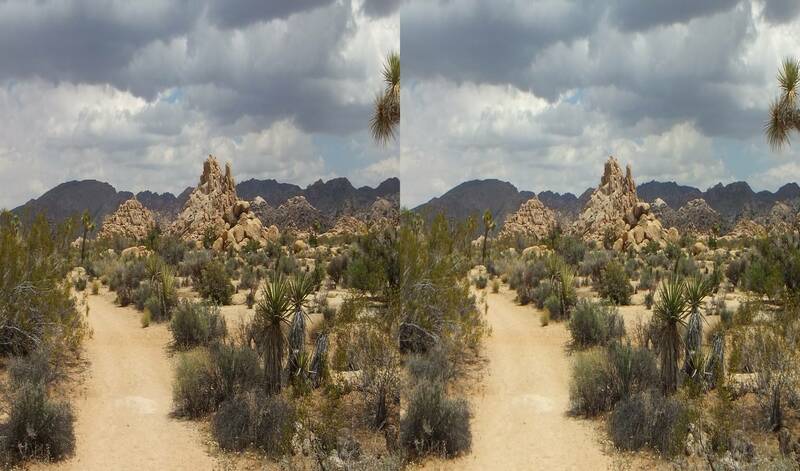 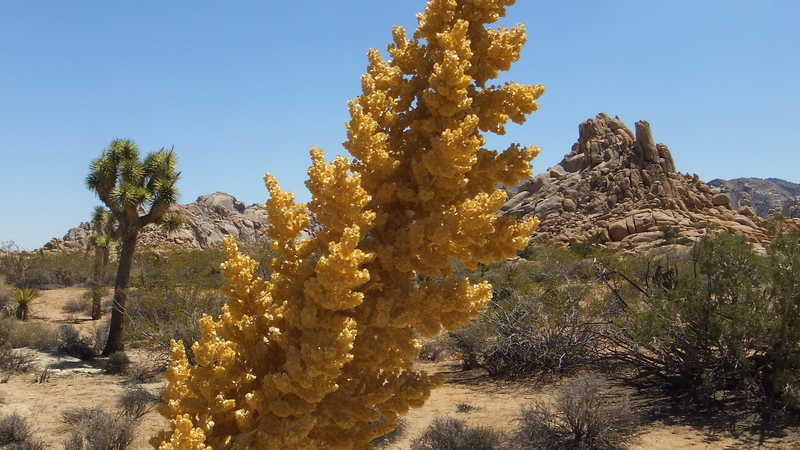 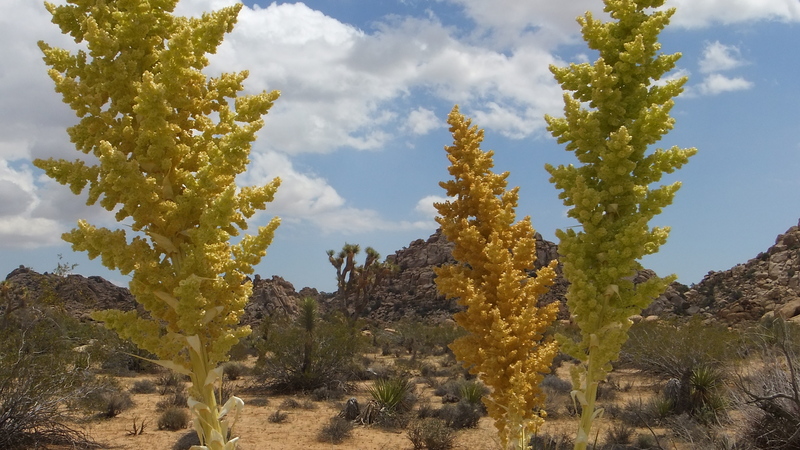 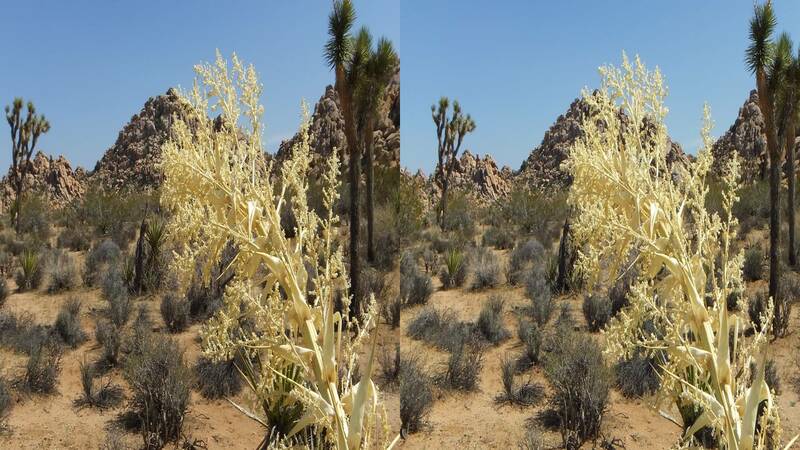 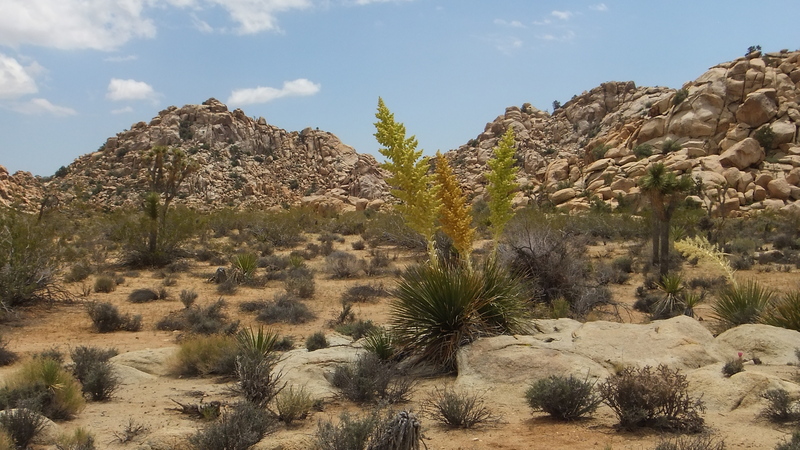 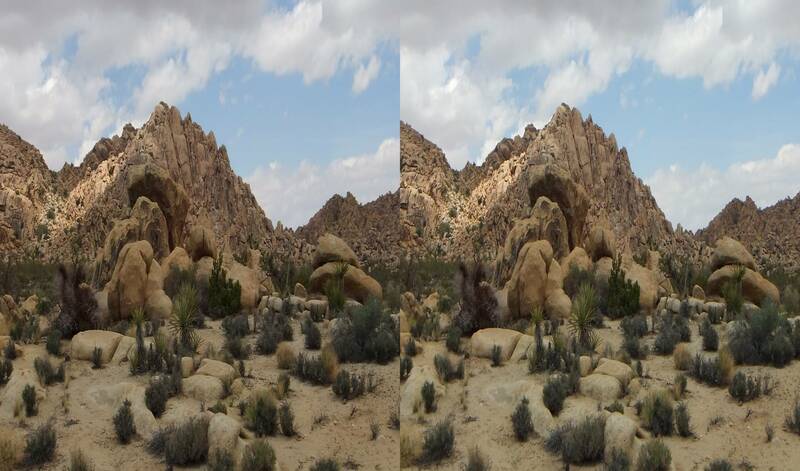 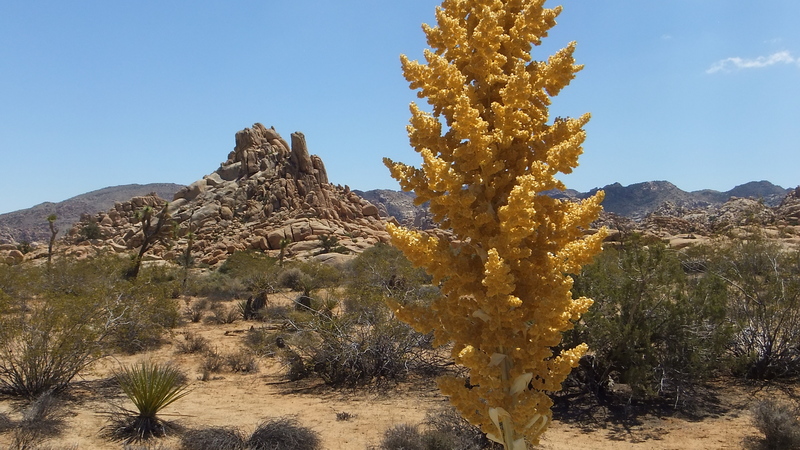 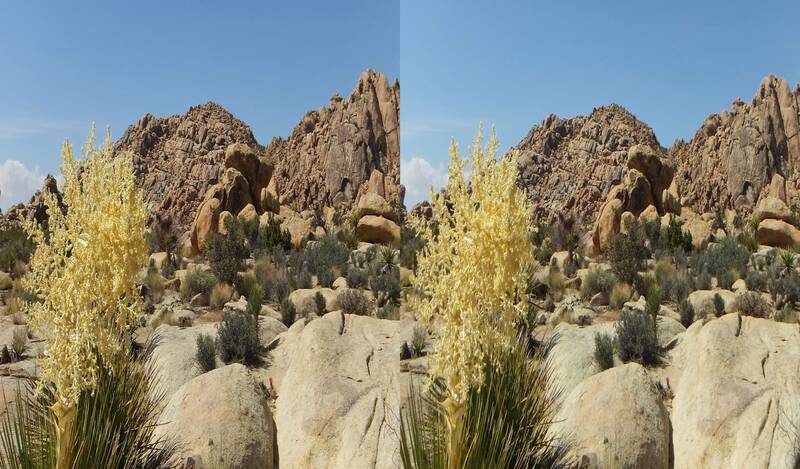 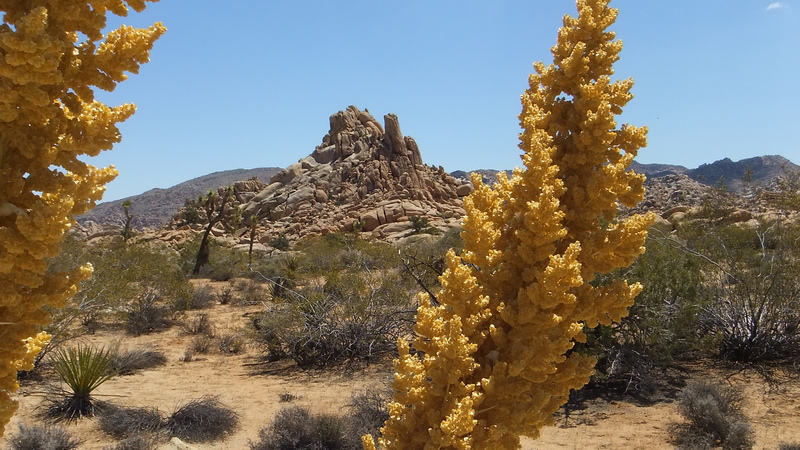 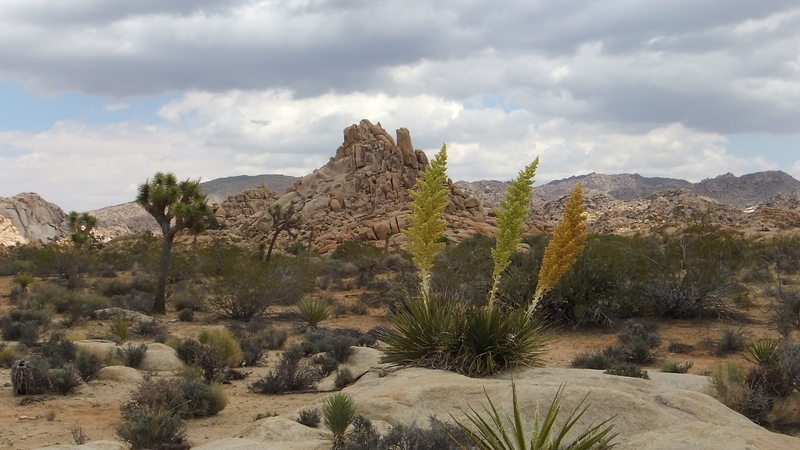 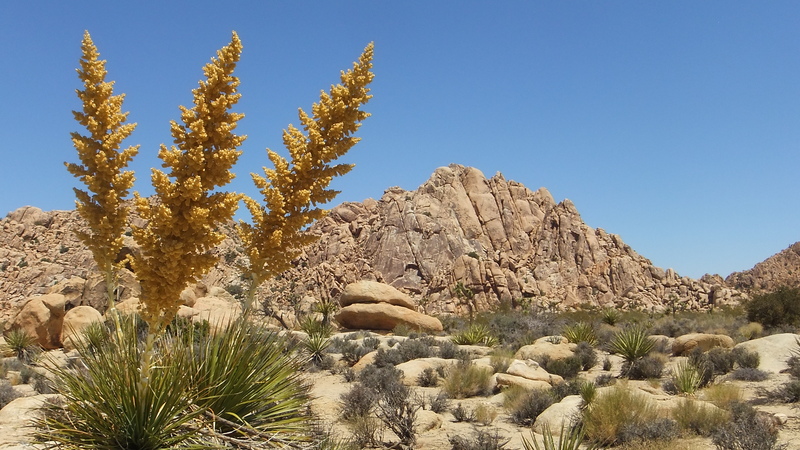 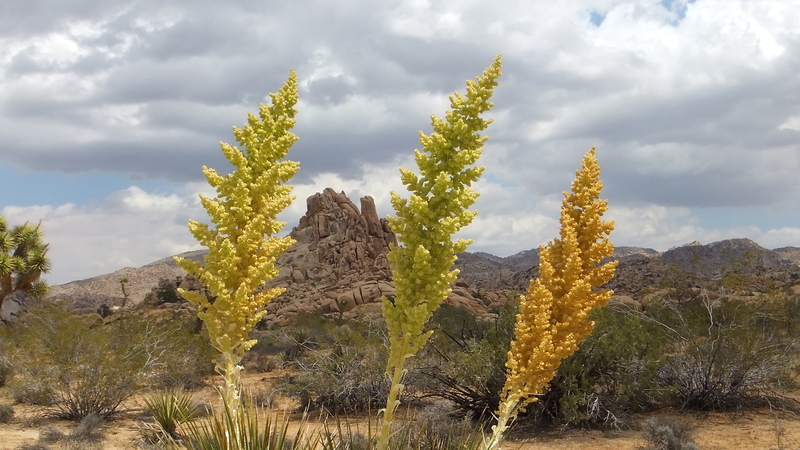 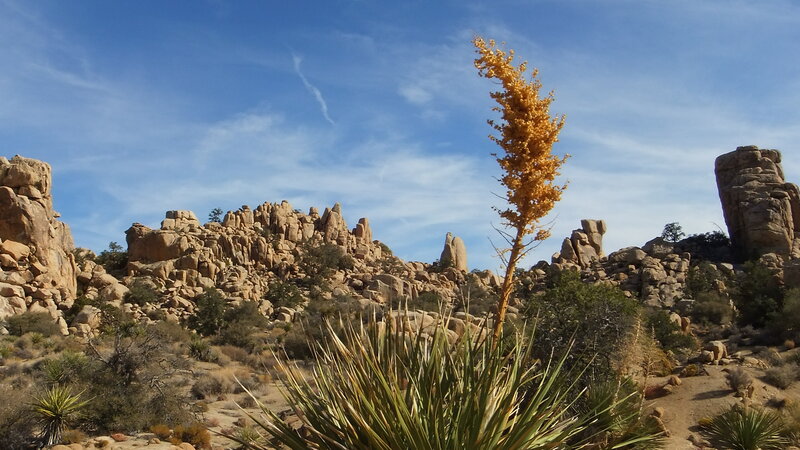 Expect JTNP to vary the environment during the day. 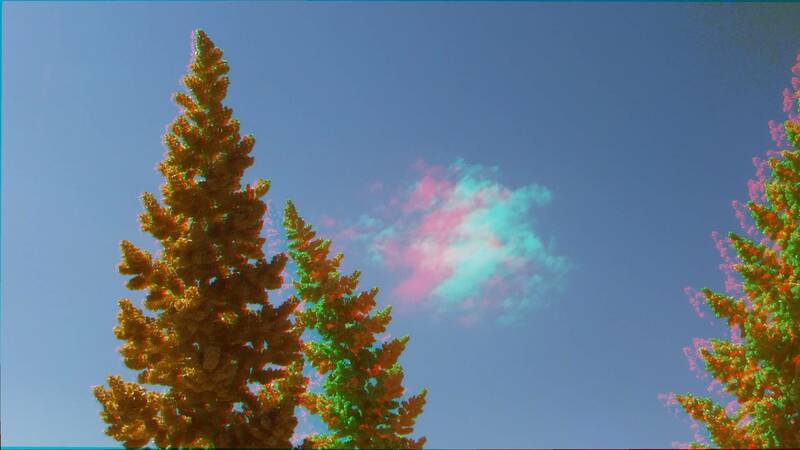 I noticed that the entire cloud-mass above had been edging eastward, being pushed by a strong breeze from the SW. 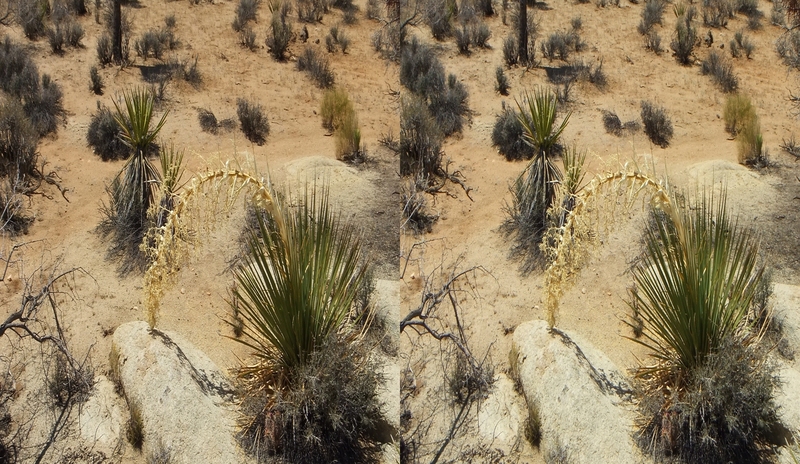 Therefore, I decided to slow my pace and meander, since the trail headed in the wind’s direction, allowing the sun time to catch up, before later in the afternoon I returned for a more detailed photographic study. 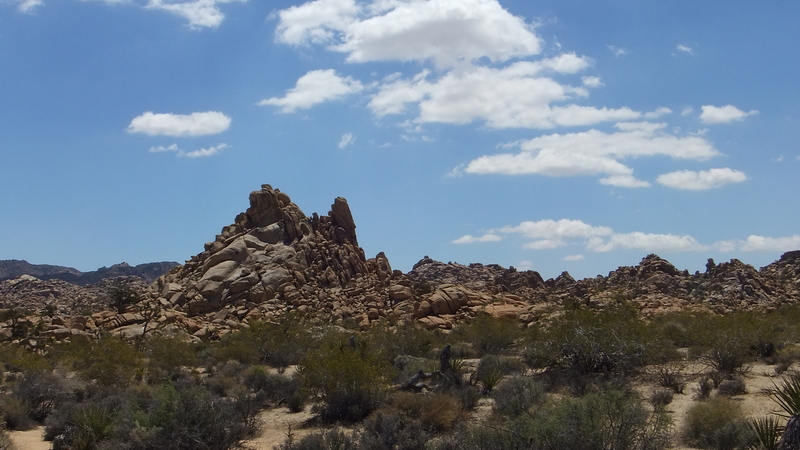 At 3:30 p.m., I found the nolinas and boulder piles fully sunlit—with some residual clouds north and east—and started snapping away like a madman*, making two full 360-degree circuits in order to capture their magnificence against the varied and startling backgrounds. 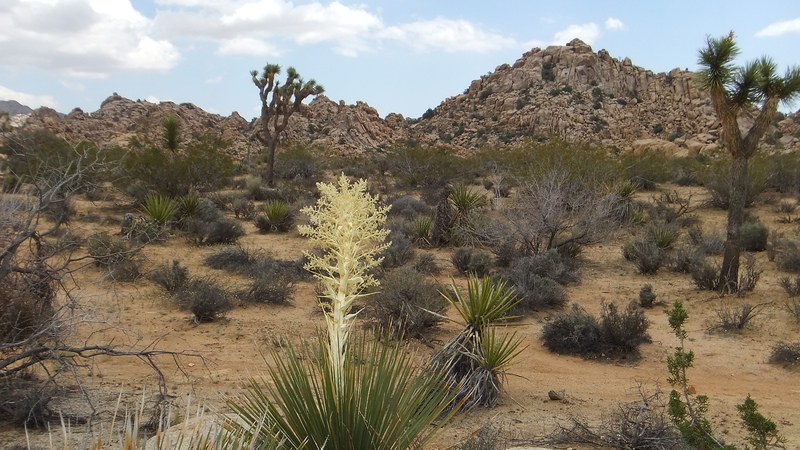 This also allowed the light to play upon them from every angle, including back-lighting their delicate petals. 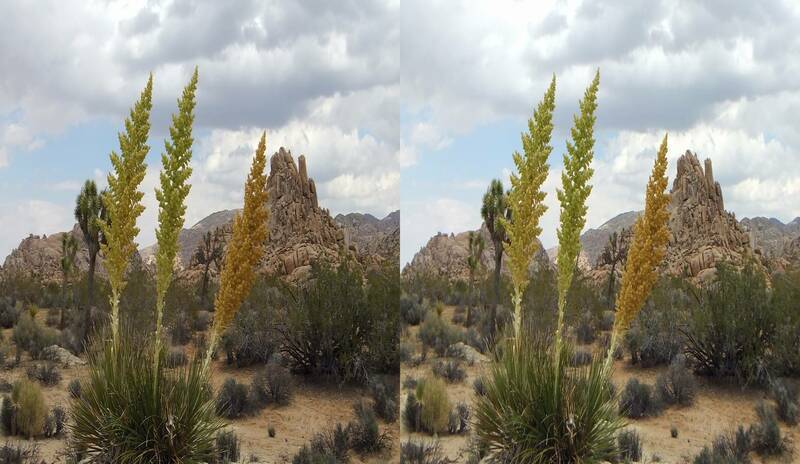 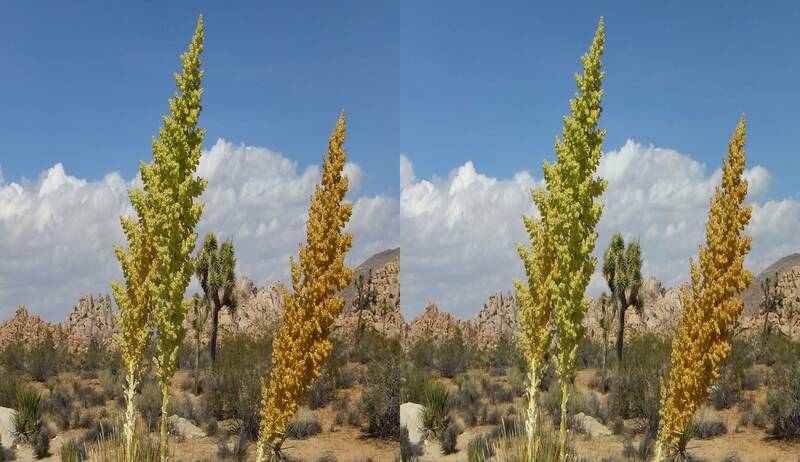 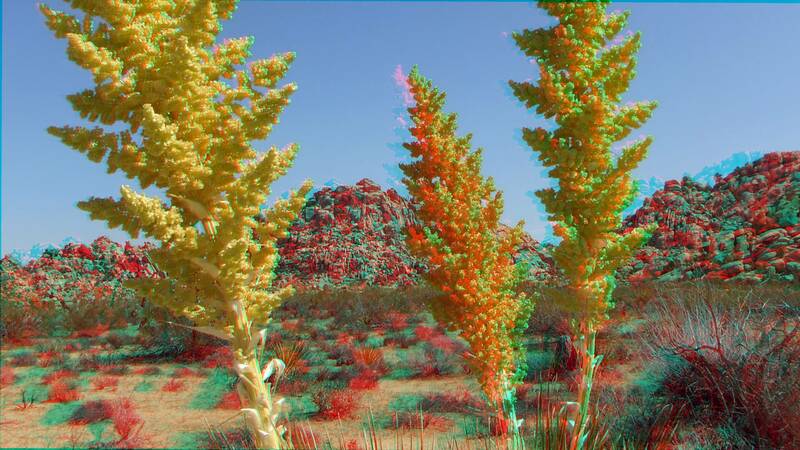 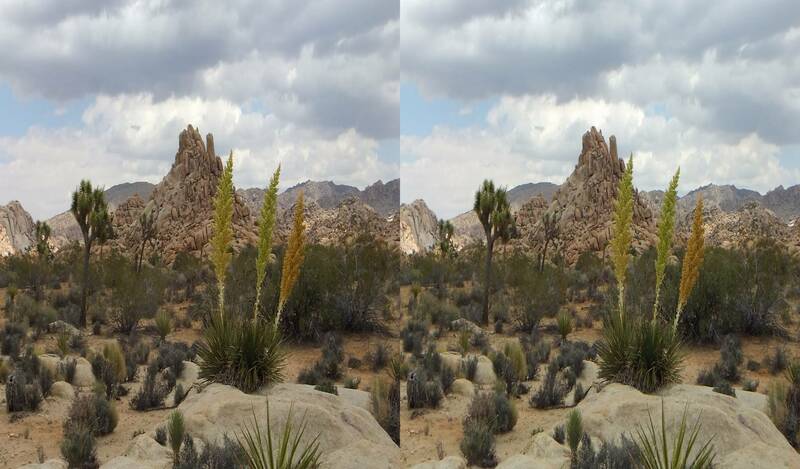 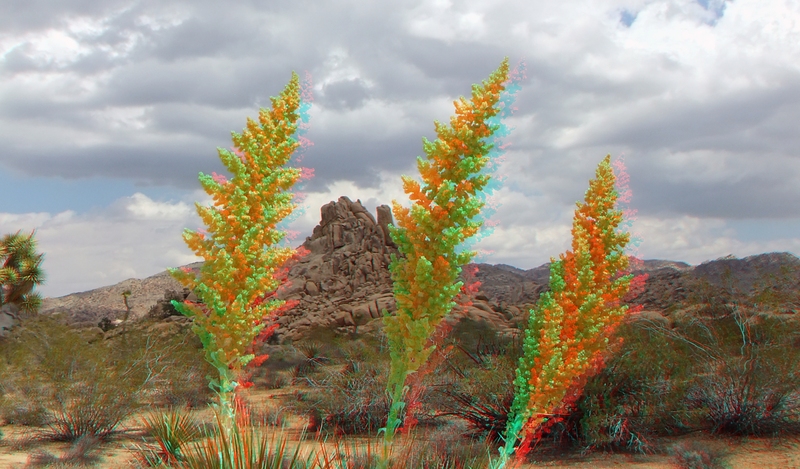 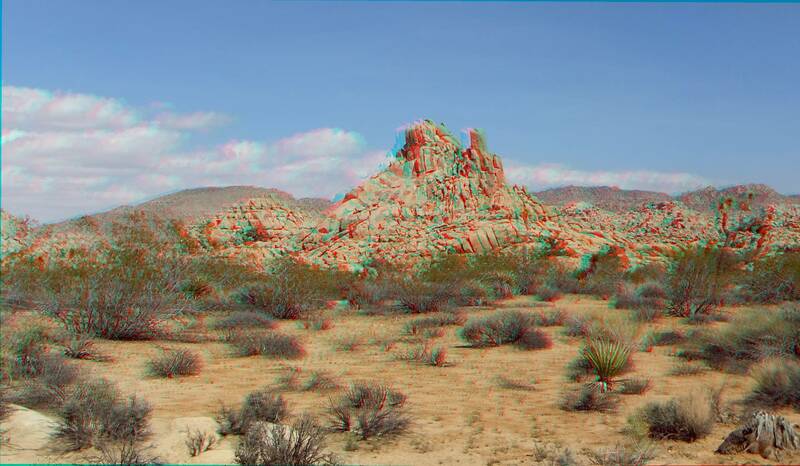 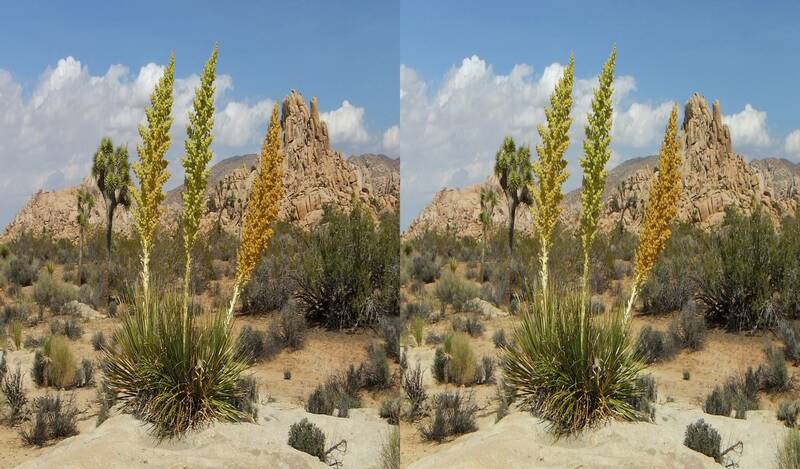 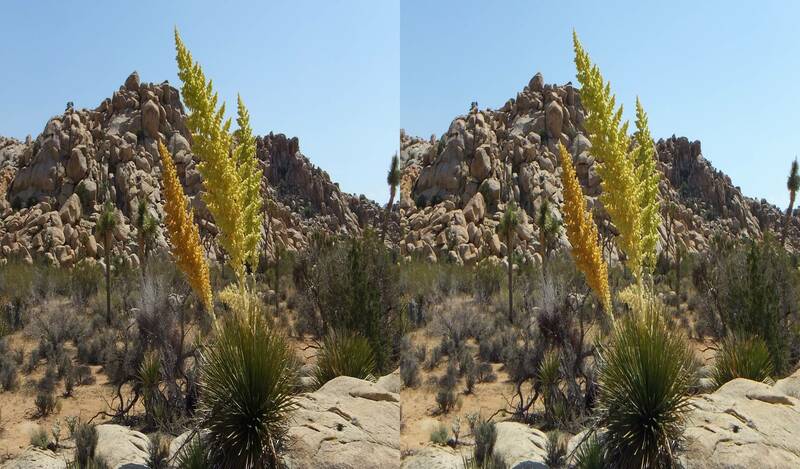 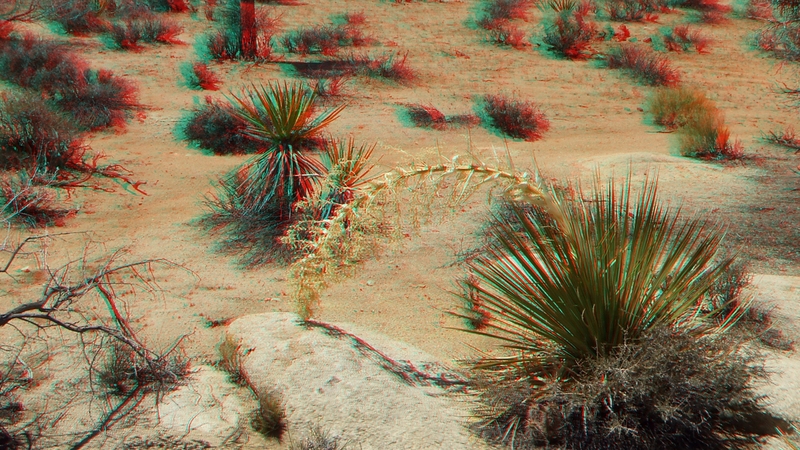 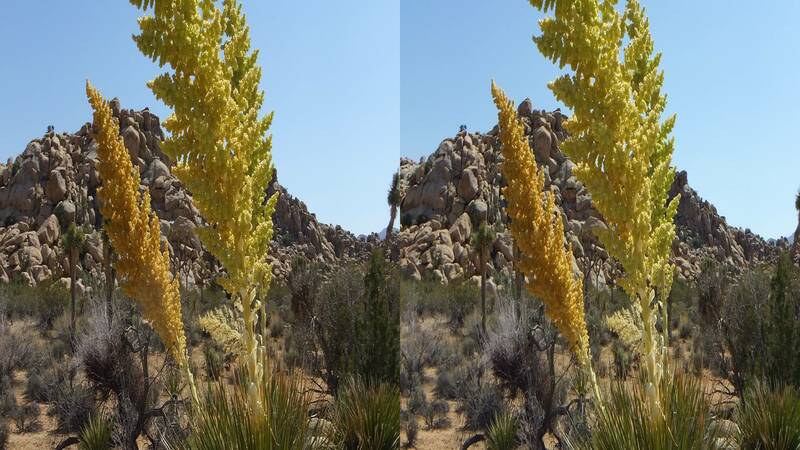 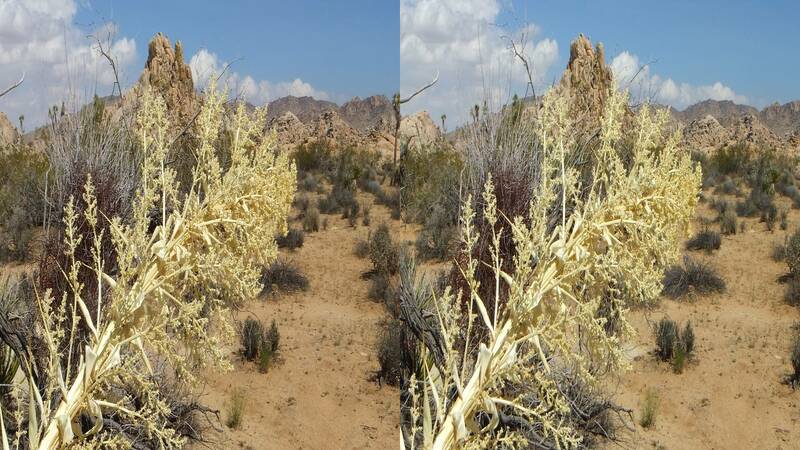 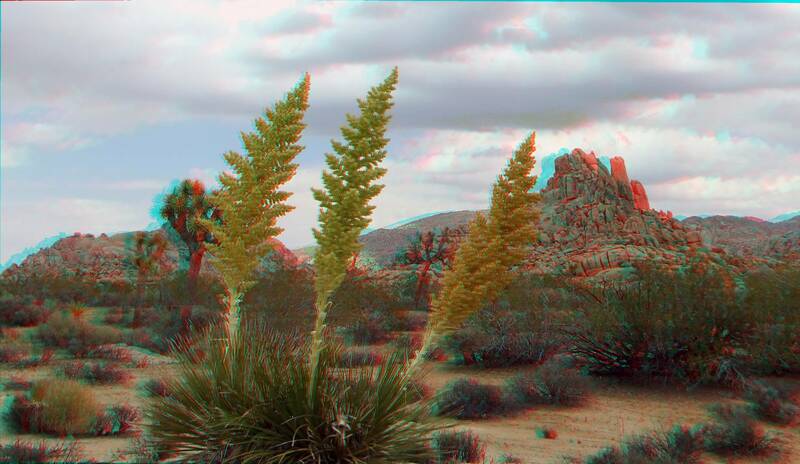 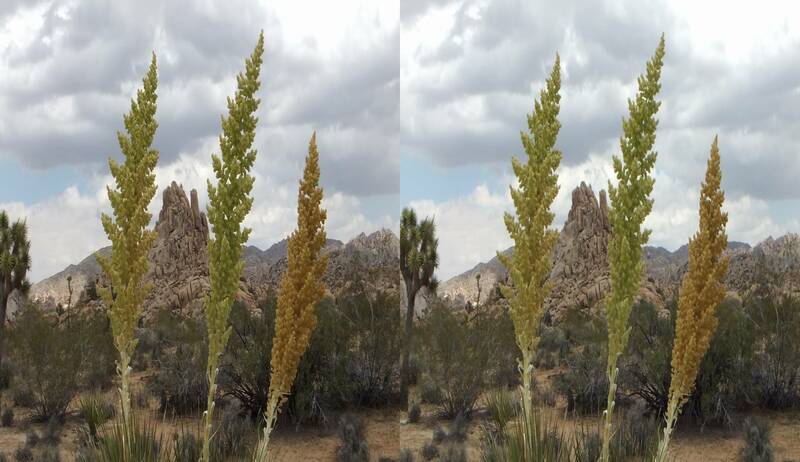 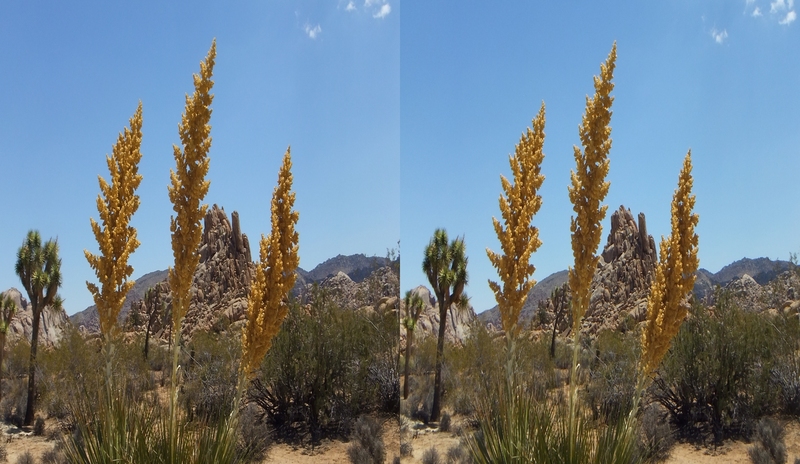 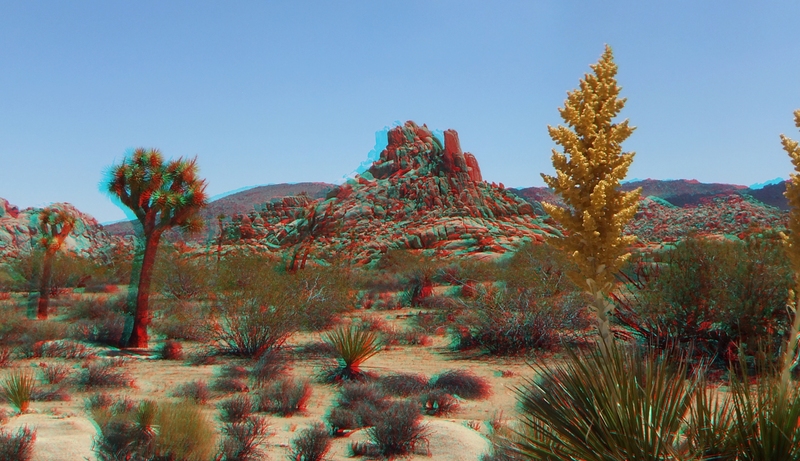 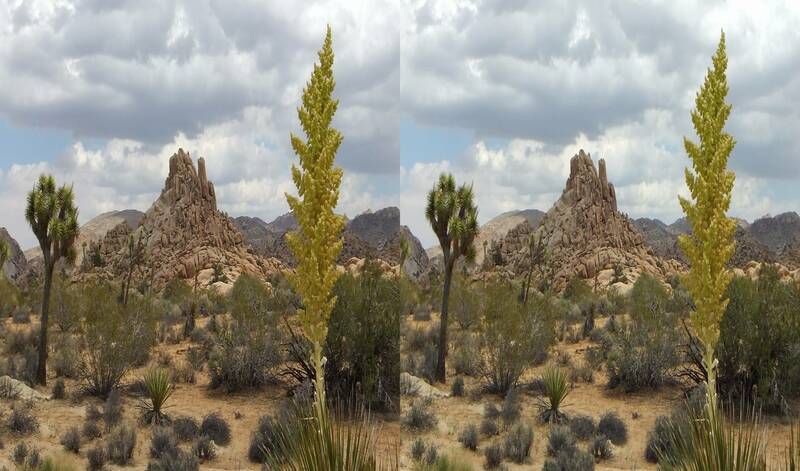 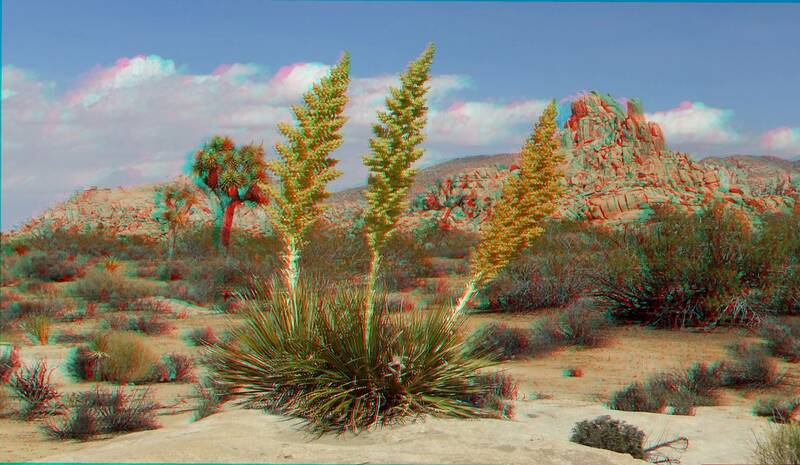 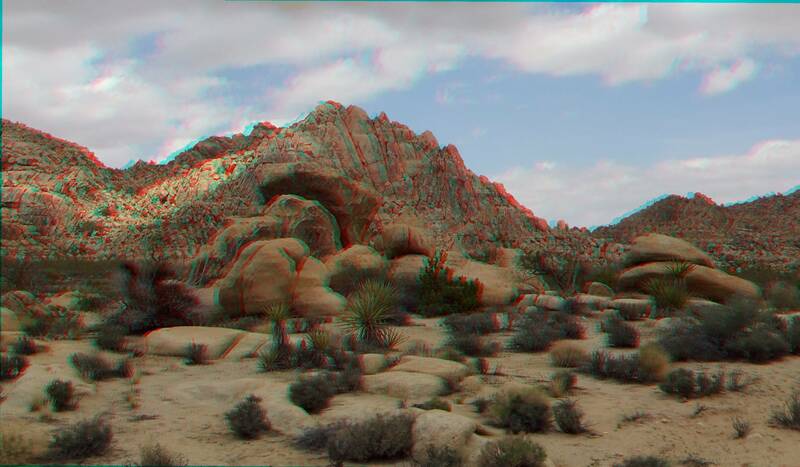 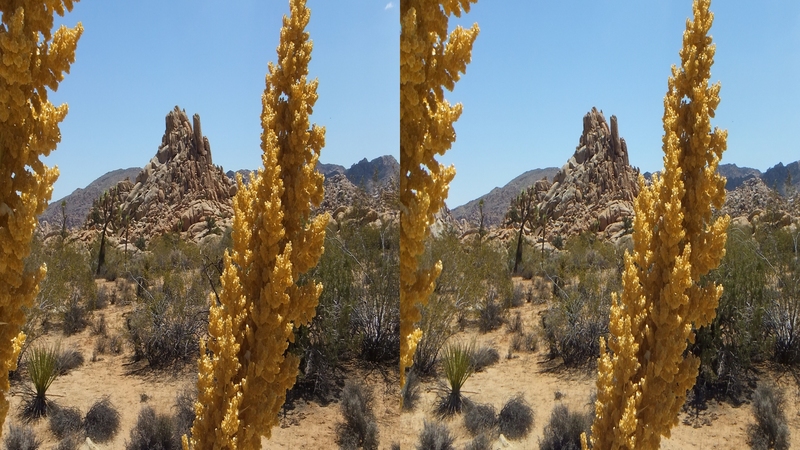 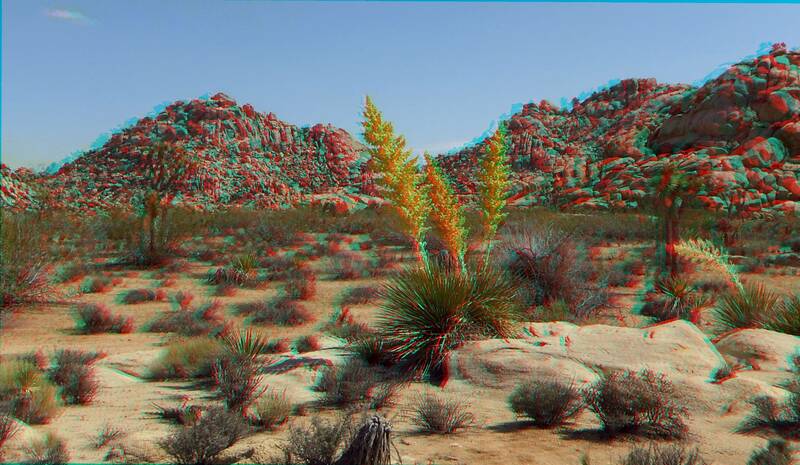 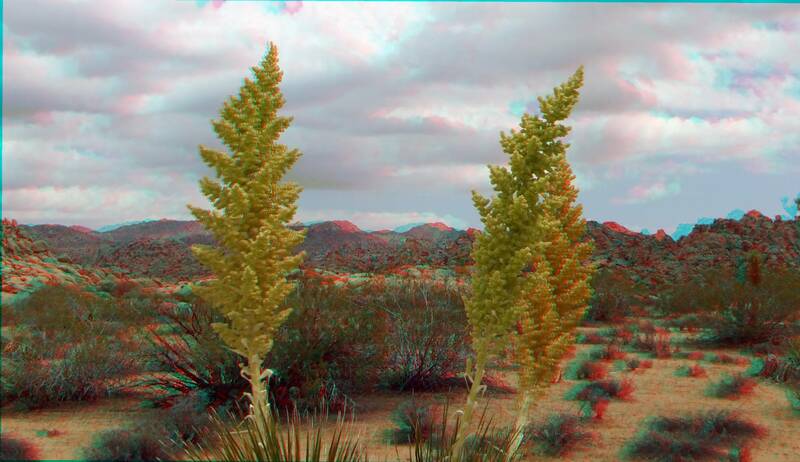 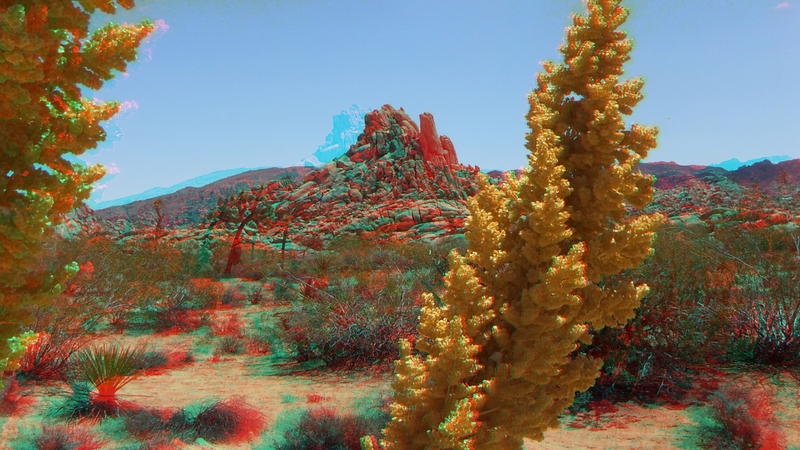 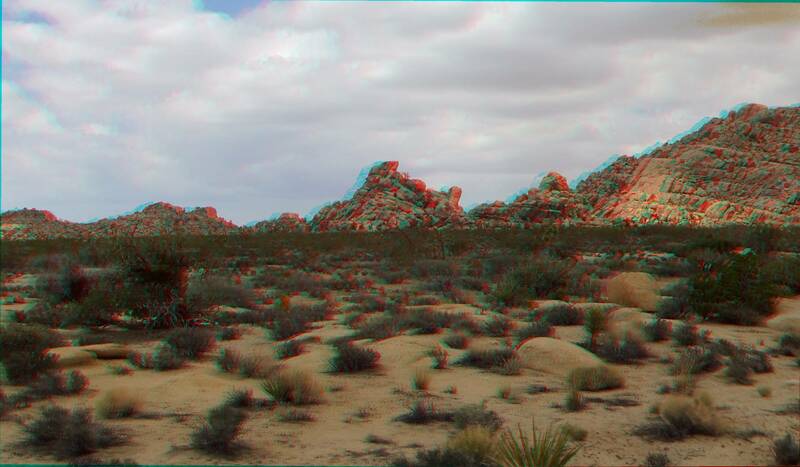 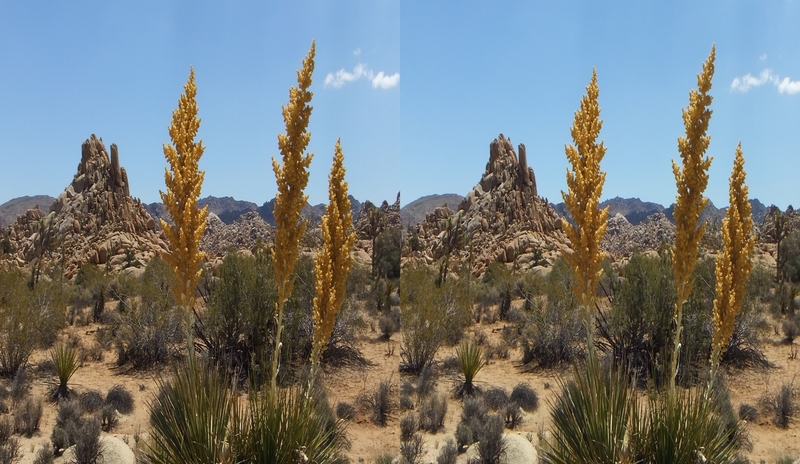 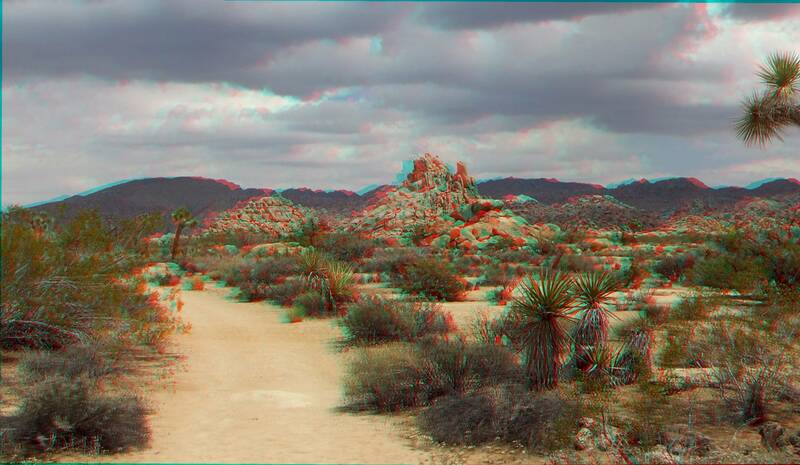 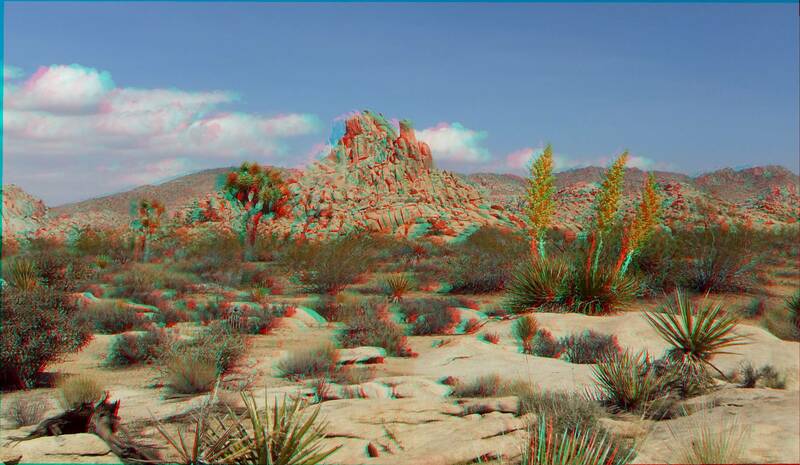 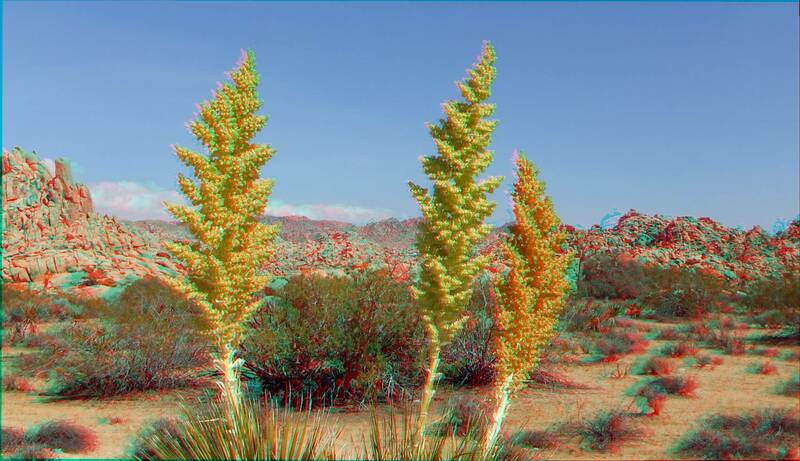 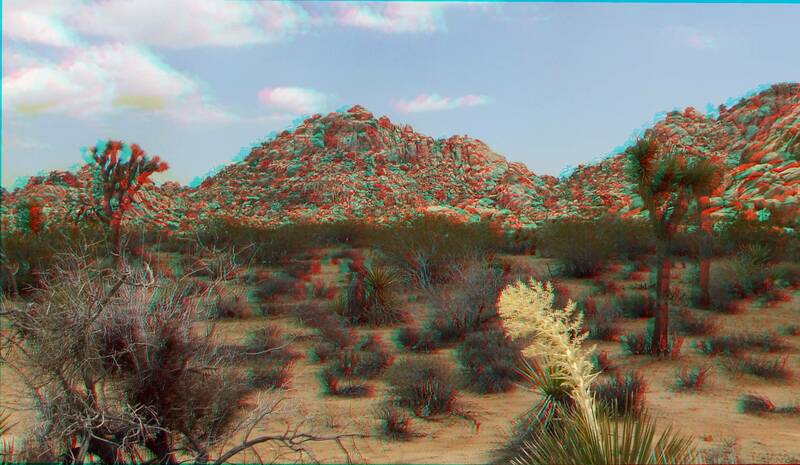 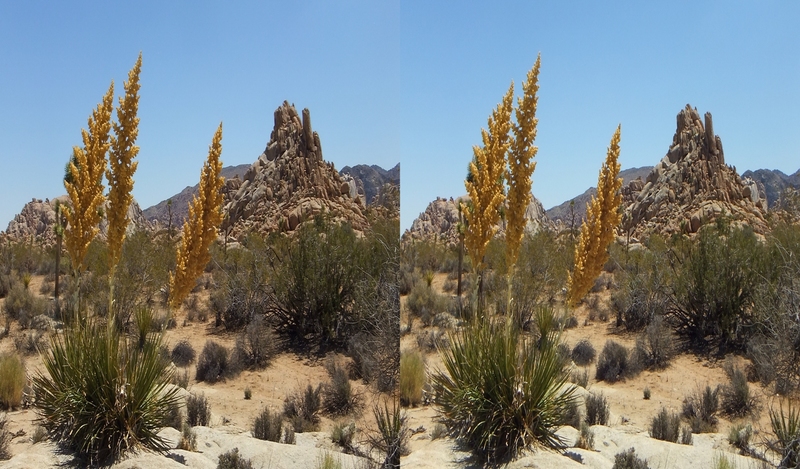 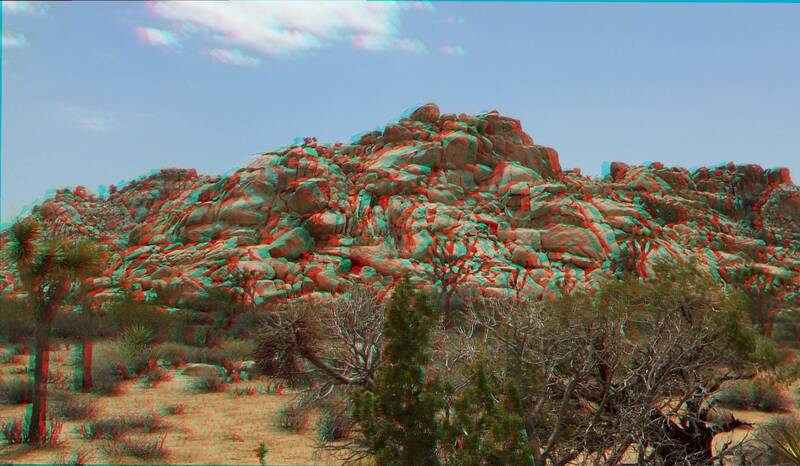 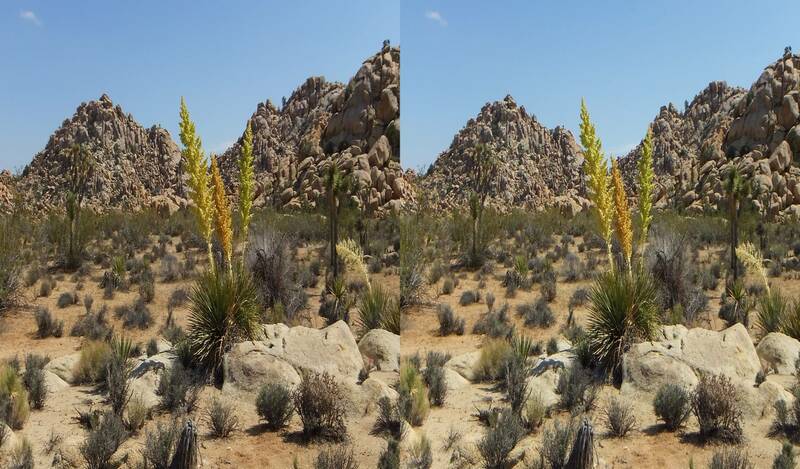 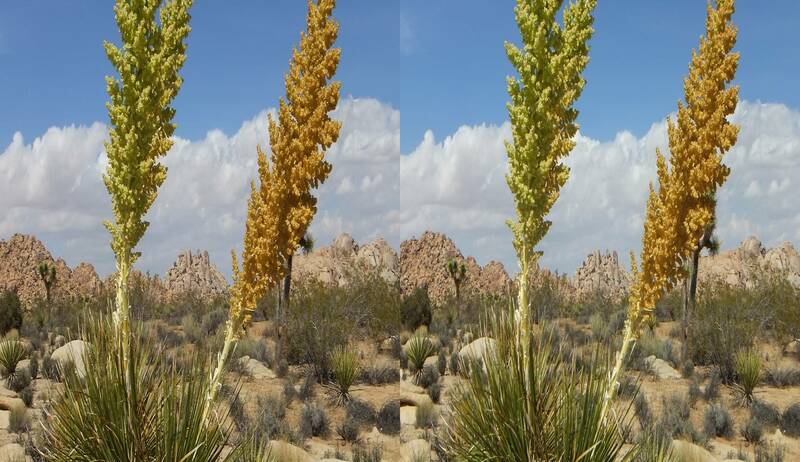 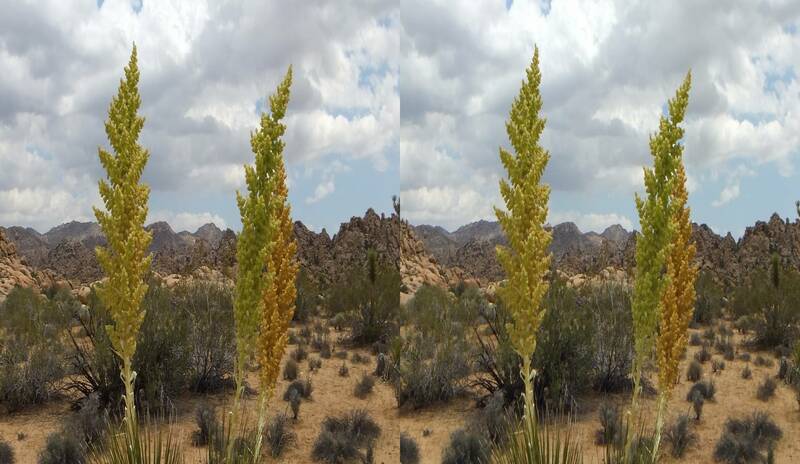 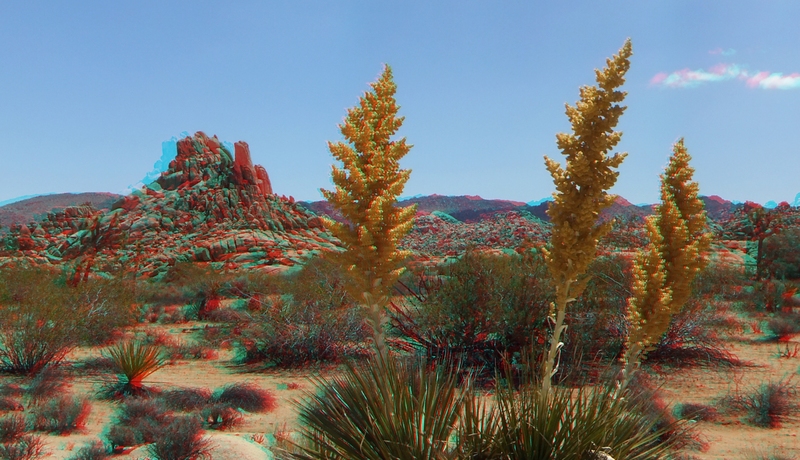 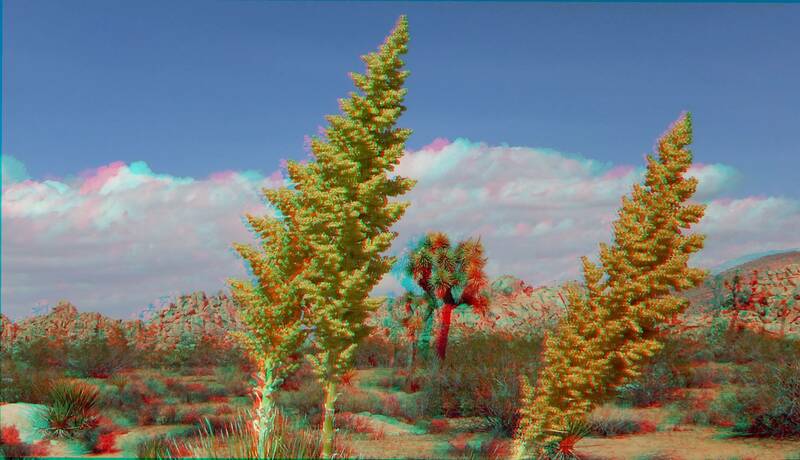 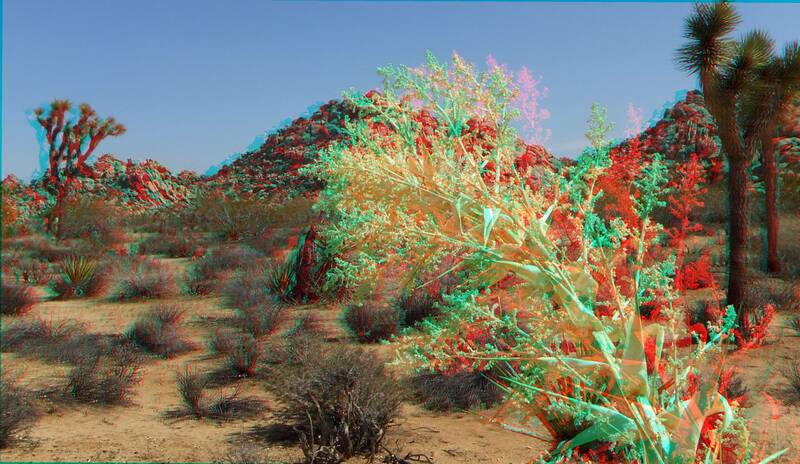 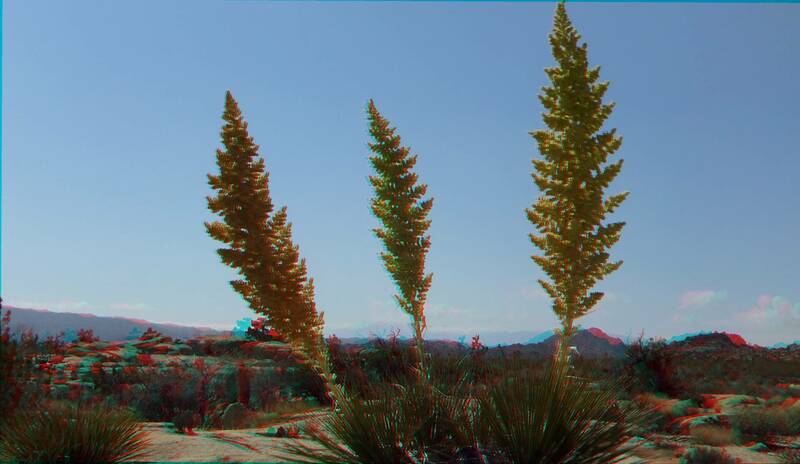 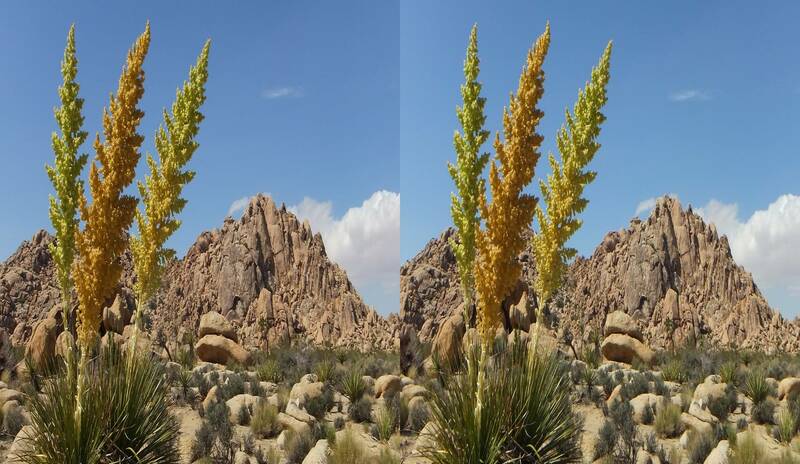 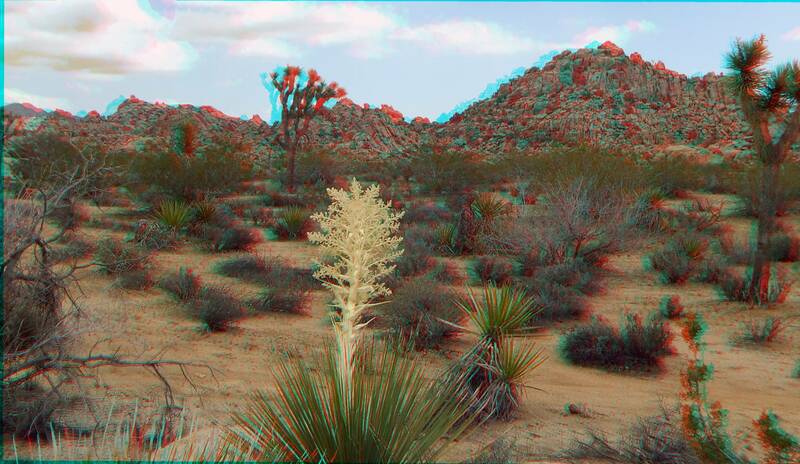 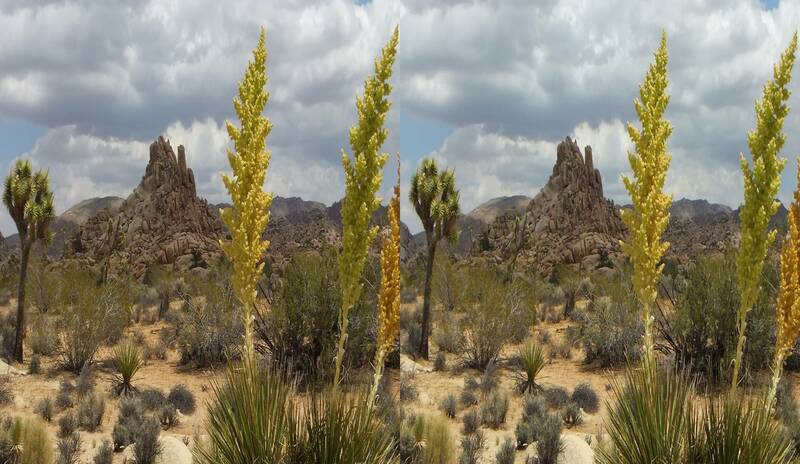 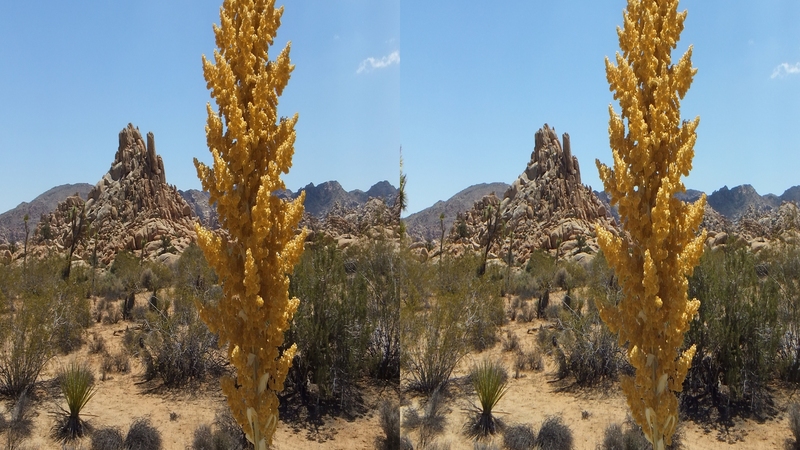 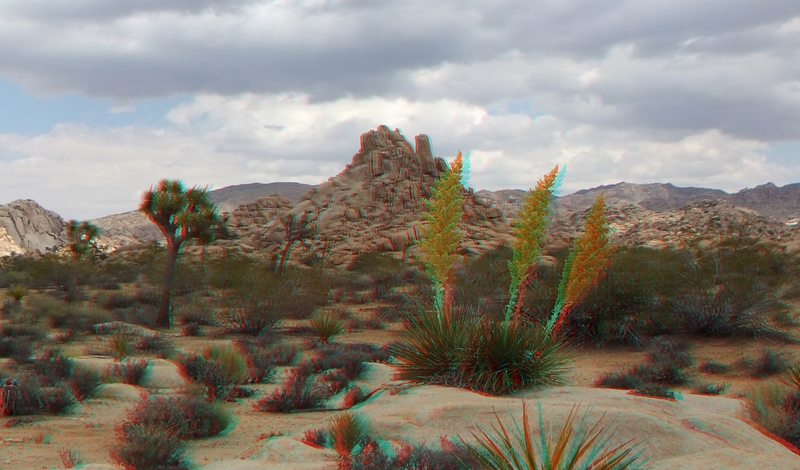 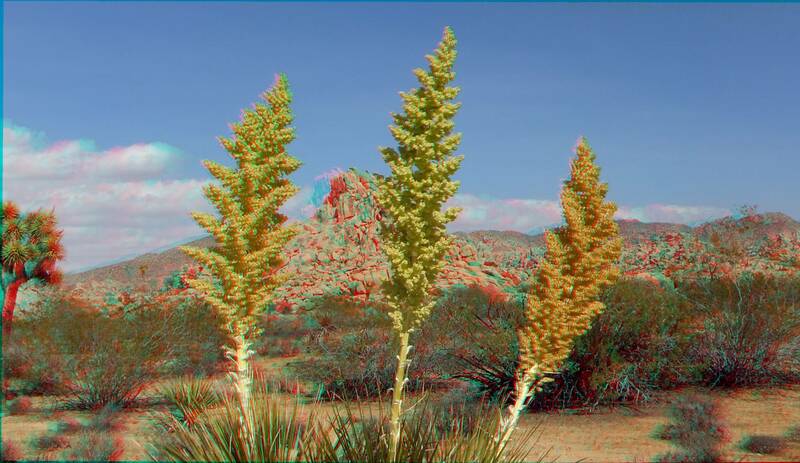 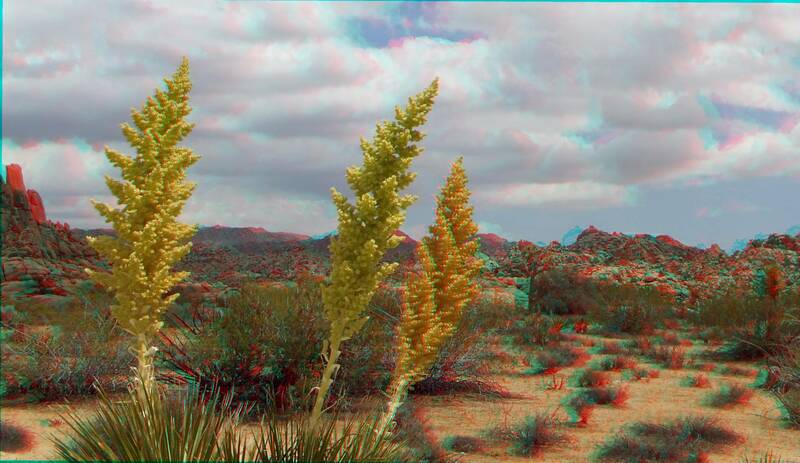 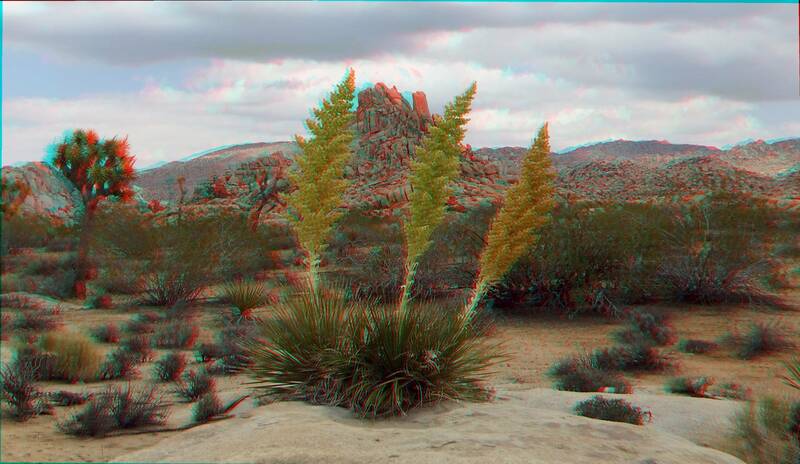 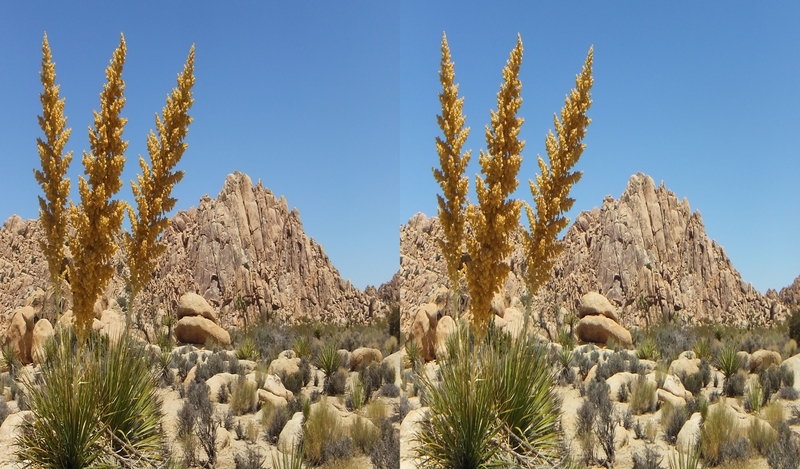 In all, I took enough 3D nolina pictures this day to fill an 11-minute slow-transition slideshow. 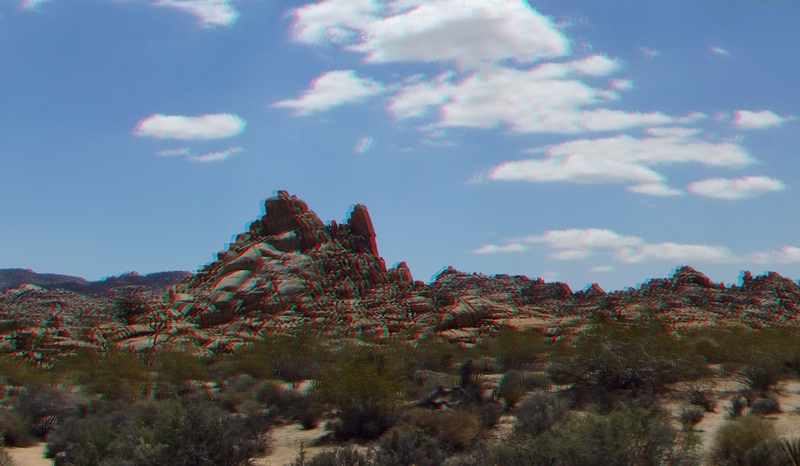 I hope to provide a link to the Youtube video soon, where viewers can watch it in 2D, 3D Anaglyph (using the red-cyan glasses to see it on their screens), as well as in 3D Half Side-by-Side where it can be downloaded and watched on a 3D television set. 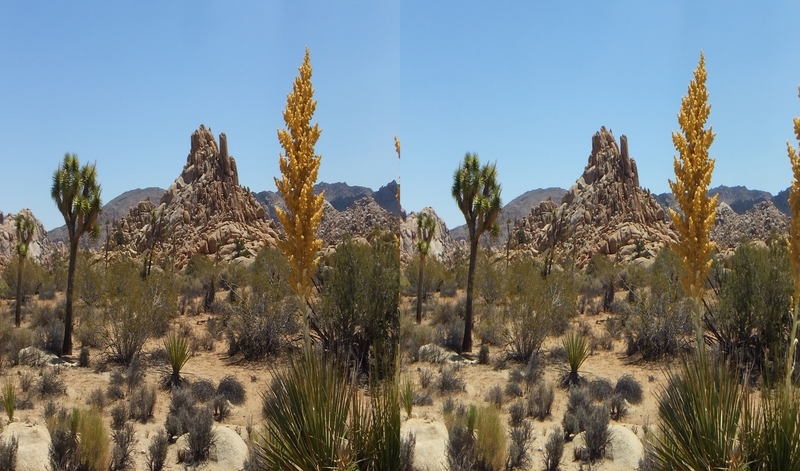 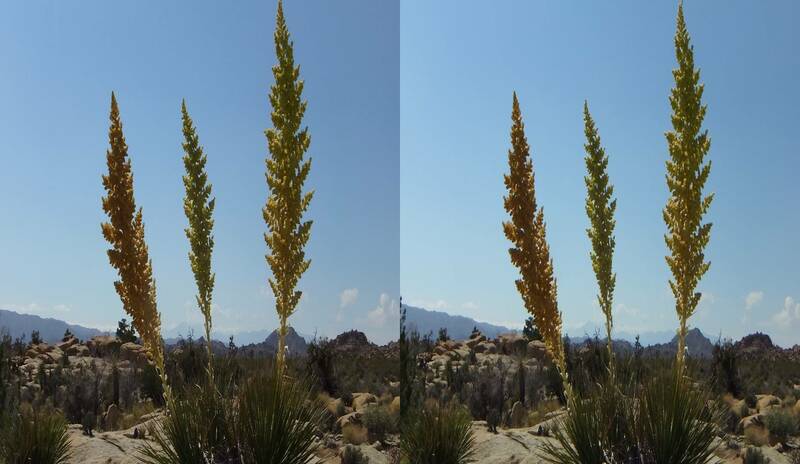 Dry desert winds and the briefness of propagation have accomplished what they must and turn the nolina trio a lovely golden brown. 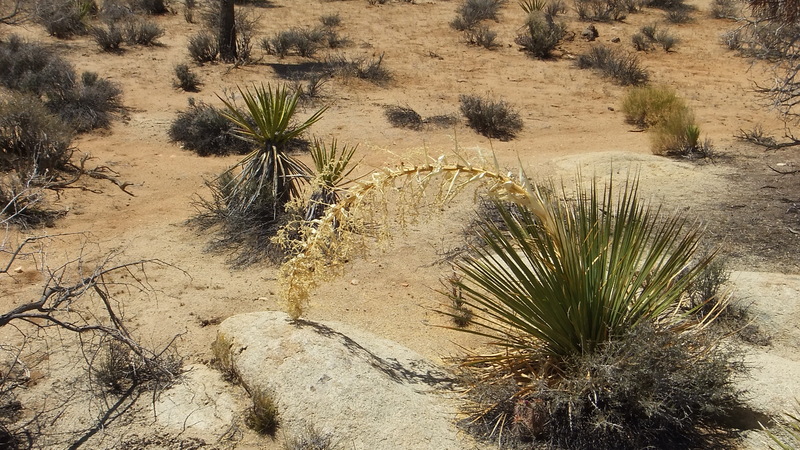 Still full, and shimmering in the sunlight, all too soon the florescence stalks will wither and shatter, scattering their tiny black sesame-sized seeds on the ground. 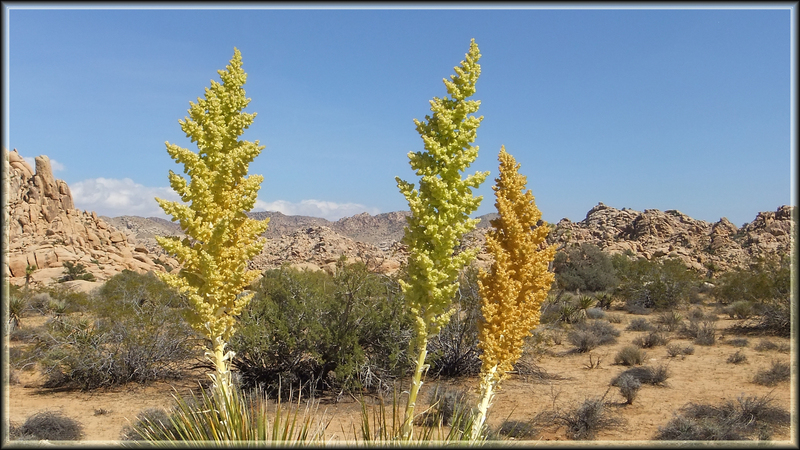 I thank my lucky stars I was there for this year’s gala event. 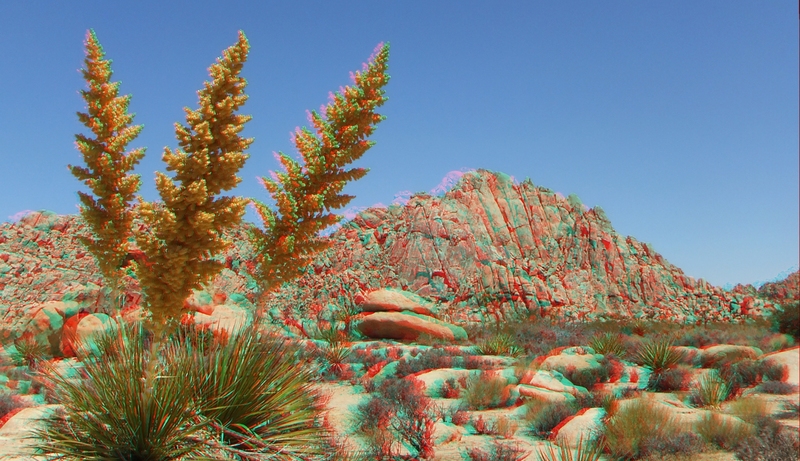 Thank you for visiting the North Wonderland Nolinas.